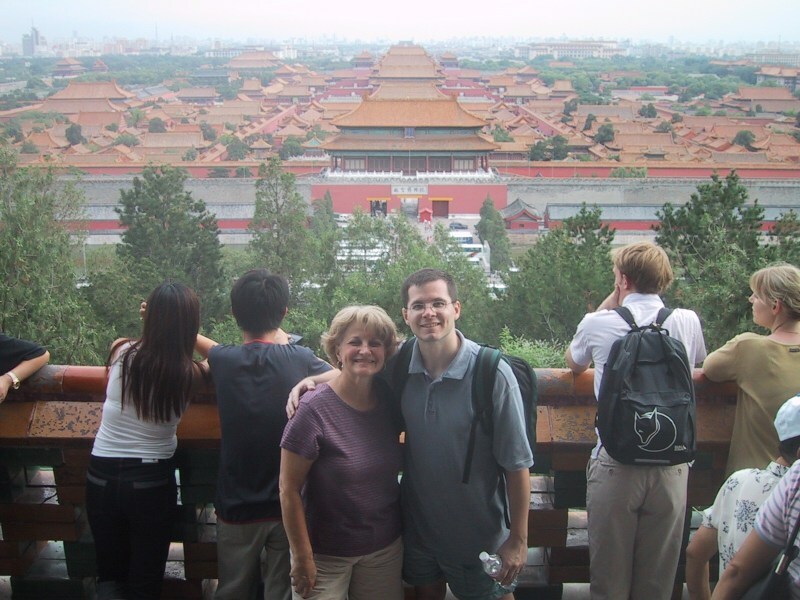 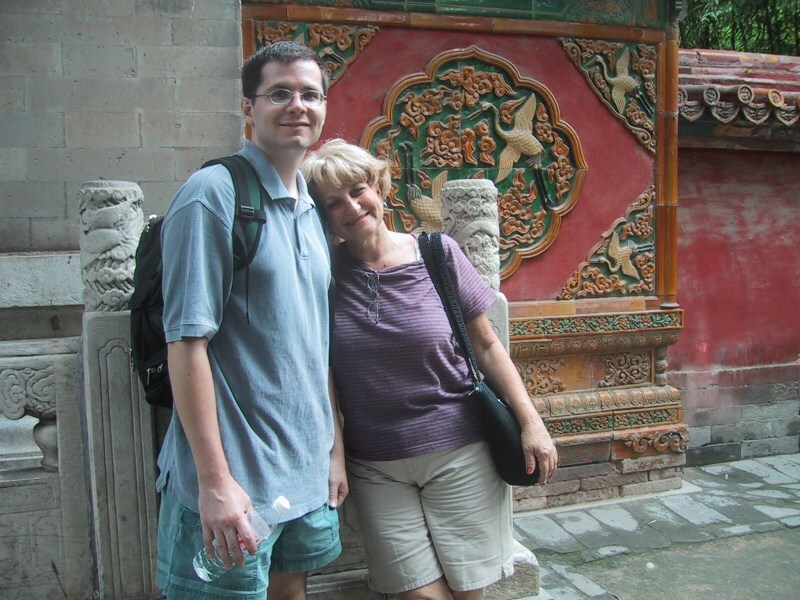 On July 26th, Bryan's mother and sister, Donna and Heather, arrived in Beijing for a 10-day vacation. 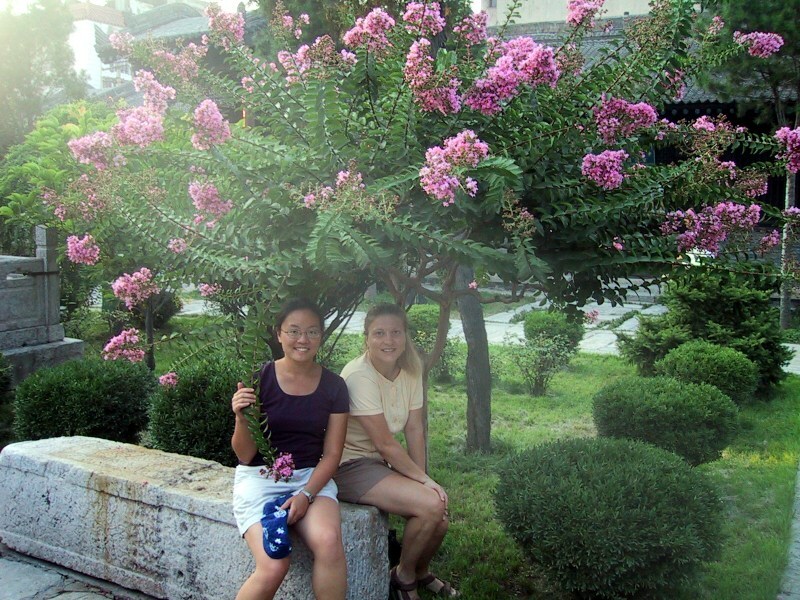 This was their first time outside of North America. 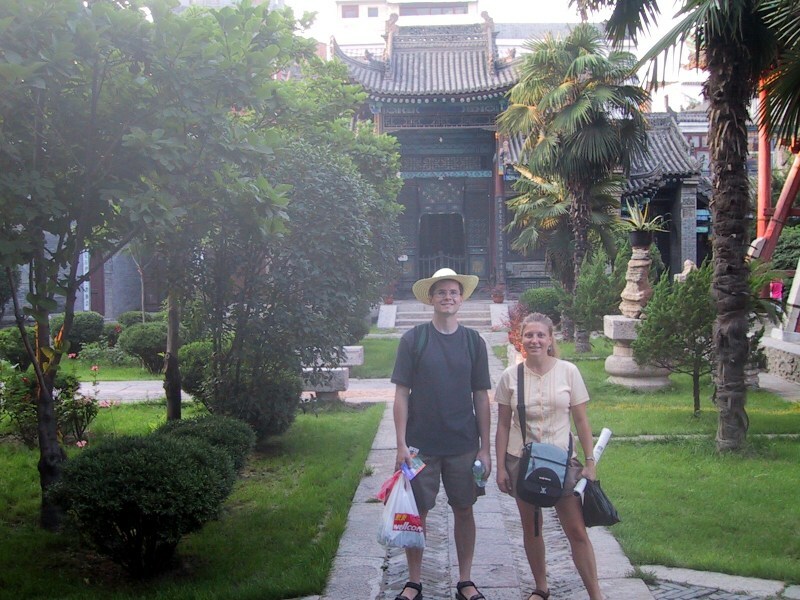 They stayed at the Zheng Ye Hotel, which is just across Shuang Shui park from our apartment building. 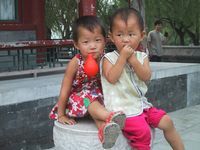 Here they are ready to hit the sack after their 13-hour flight (plus delays) from the USA. 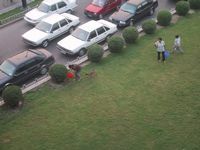 It took them 24 hours to get from Heather's apartment to this hotel. 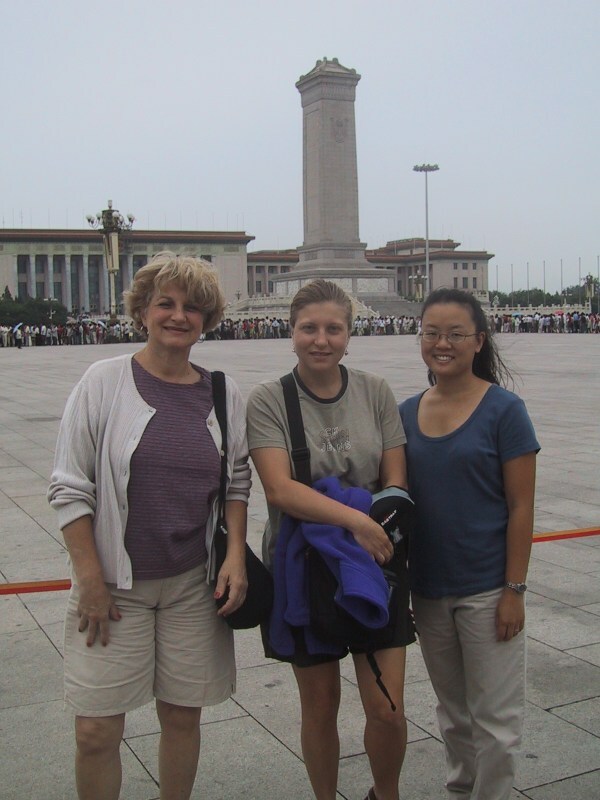 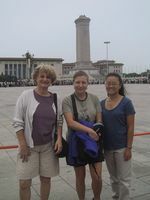 Our first stop was Tian An Men square. 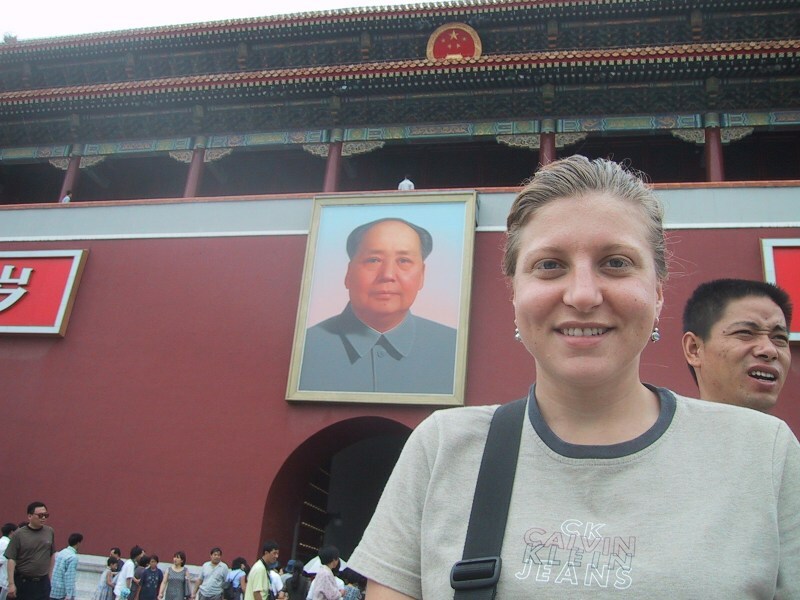 Here's Heather with Chairman Mao. 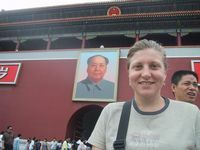 We wanted to go into the Mao Maseoleum but it was to close in an hour and the line was about 500 people long, so we skipped it. 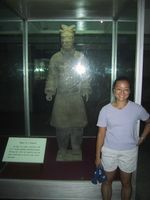 Who would want to see a preserved, possibly decomposing body anyways? 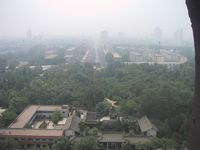 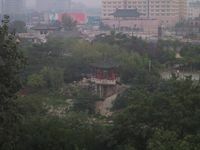 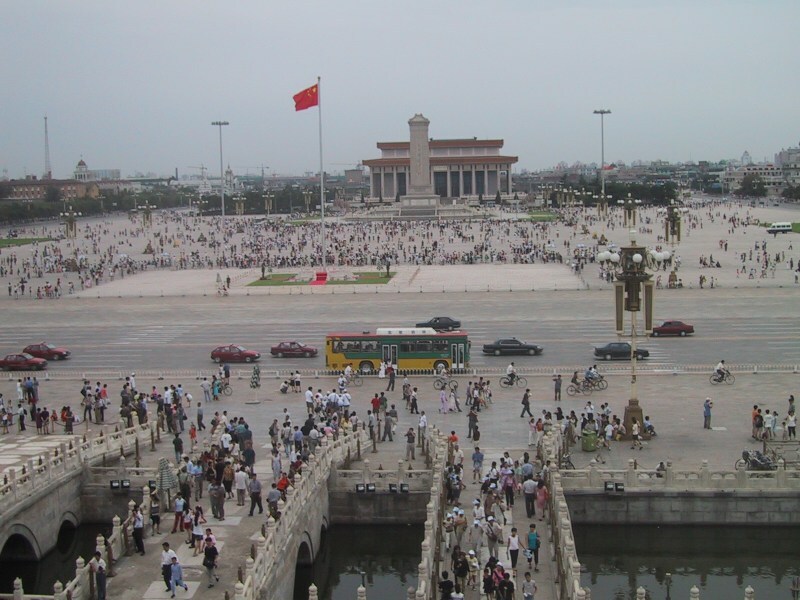 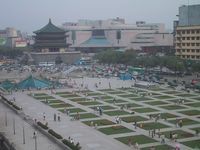 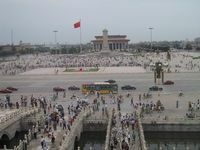 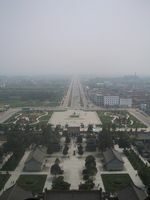 This is Tian An Men square from the watchtower of the Forbidden Palace. 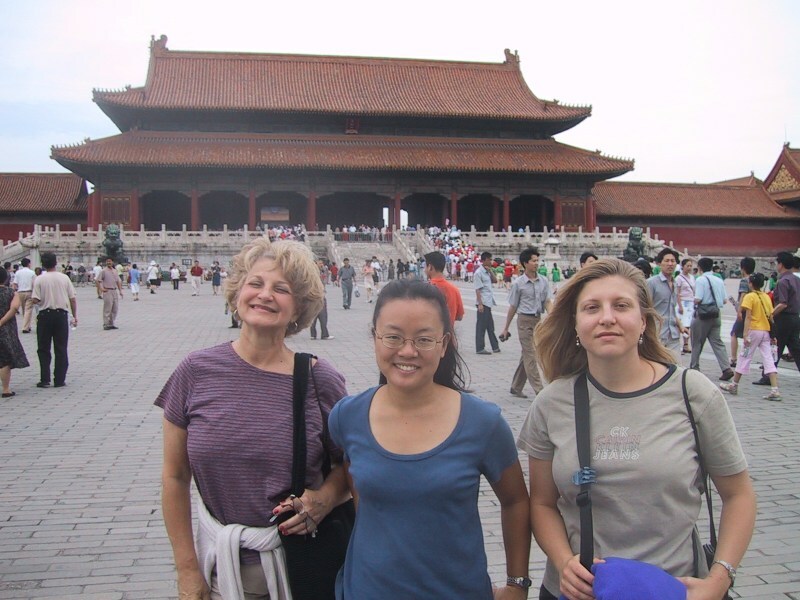 Donna, Nancy, and Heather - windswept beauties. 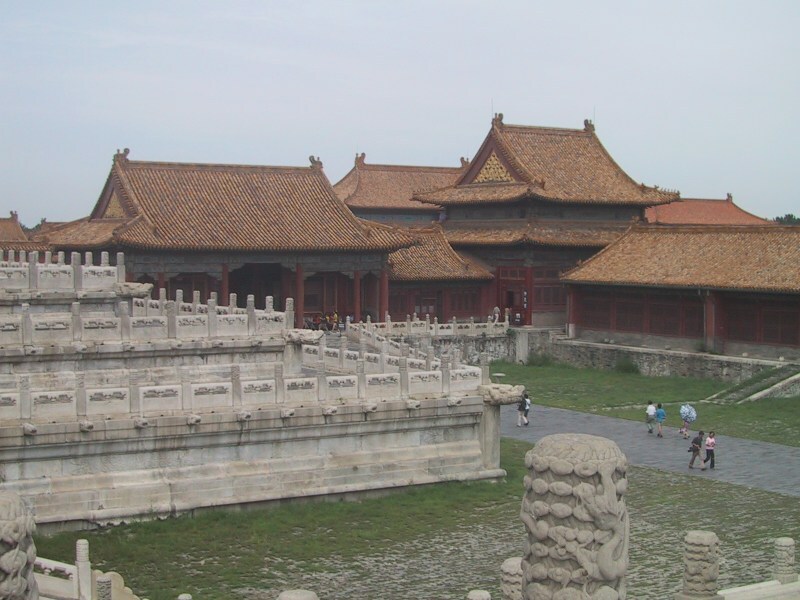 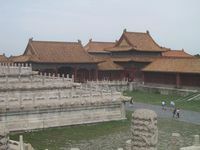 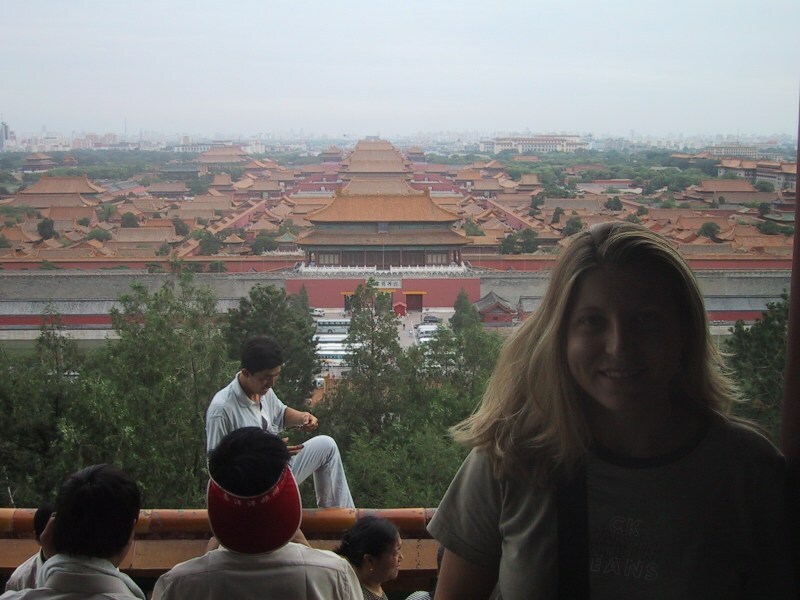 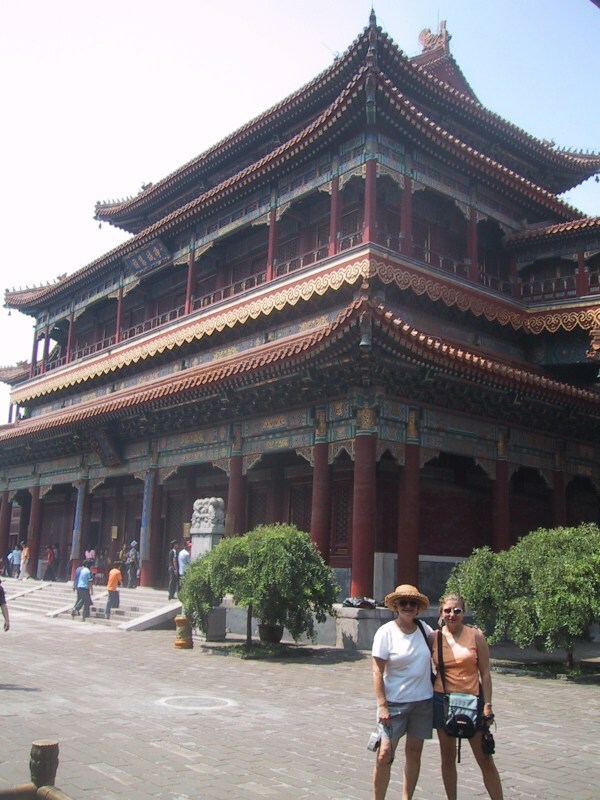 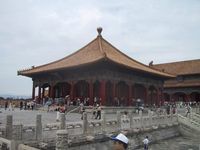 Highlights and details of the Forbidden City (Gu Gong). 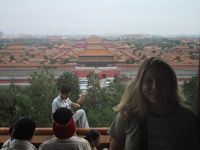 From the Forbidden City we went to Jing Shan park to climb the hill and enjoy a great view of the Forbidden City. 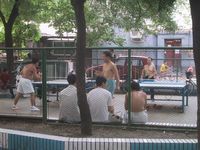 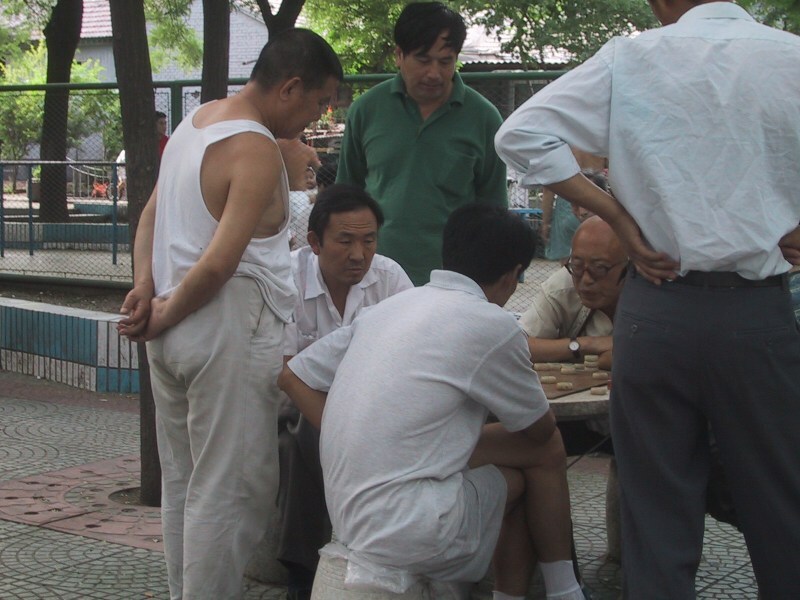 On the way out of the park we happened upon some men playing Chinese Chess and ping-pong - two popular street games. 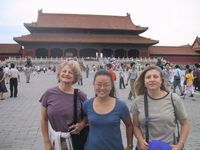 The next day Donna, Bryan, and Heather went to Beijing's Lama Temple while Nancy went to the train station to buy tickets. 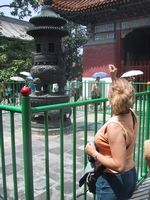 A statue at the entrance to the temple brings good luck to those who manage to land coins inside it. Donna and Heather tried their luck. 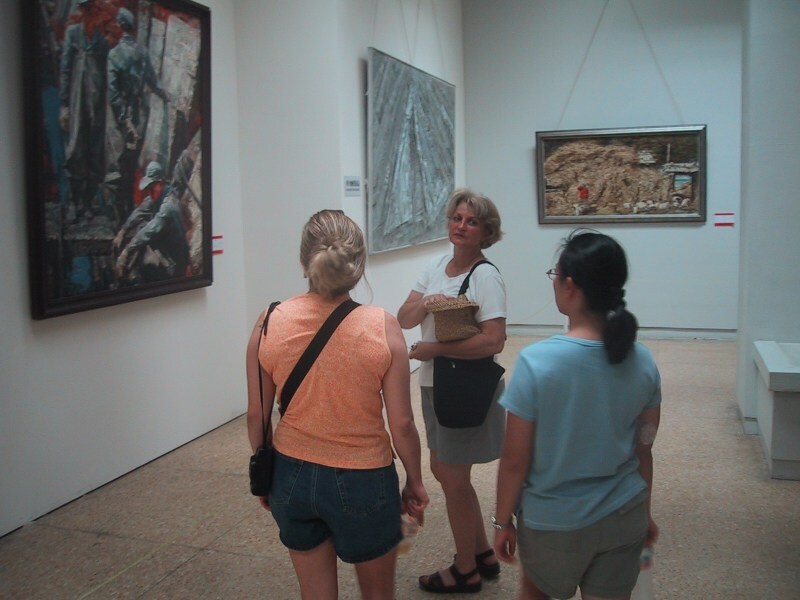 Next stop: the China Art Museum. 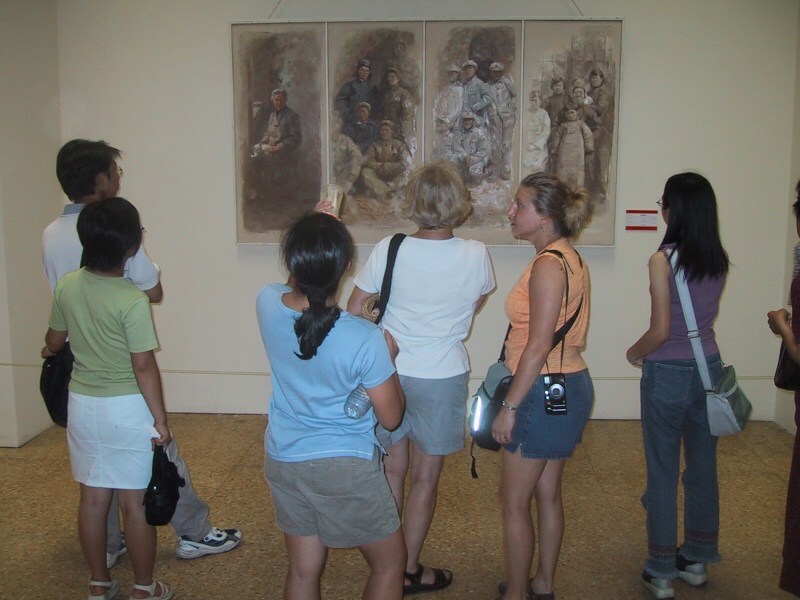 Here are the girls admiring the Chinese paintings. 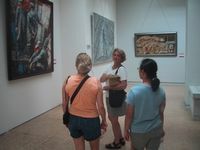 It was a fantastic art museum. 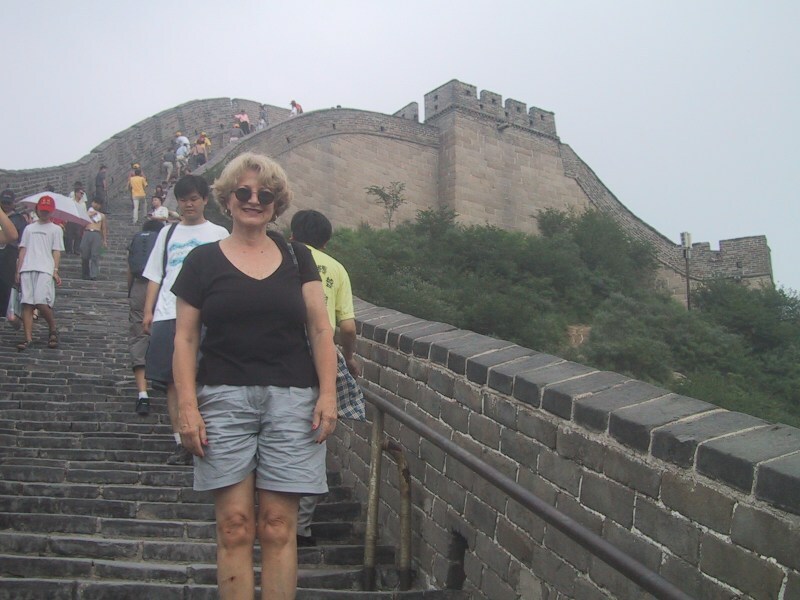 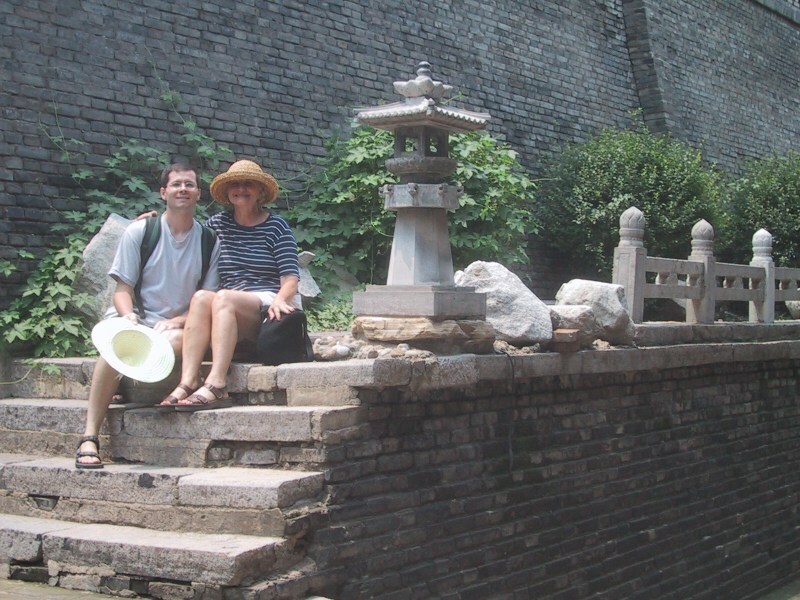 The next day we rented a cab and set out for the Great Wall of China at Ba Da Ling. 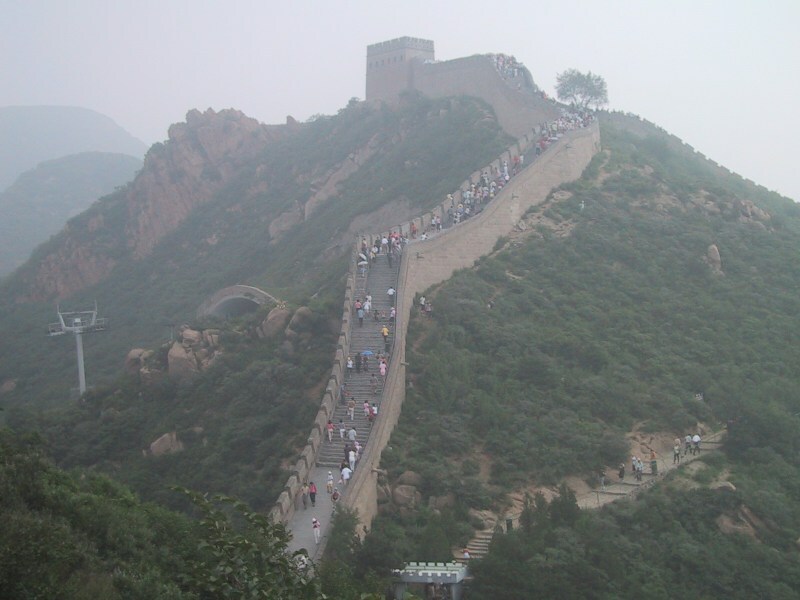 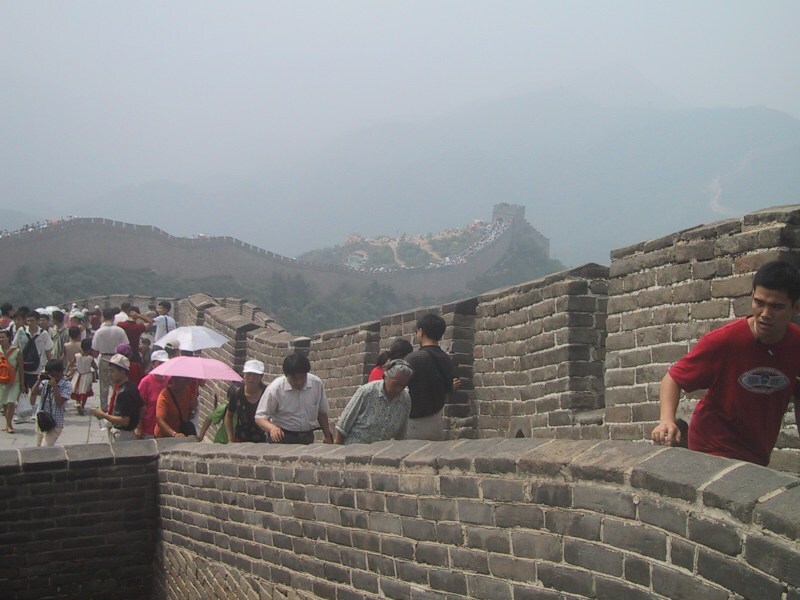 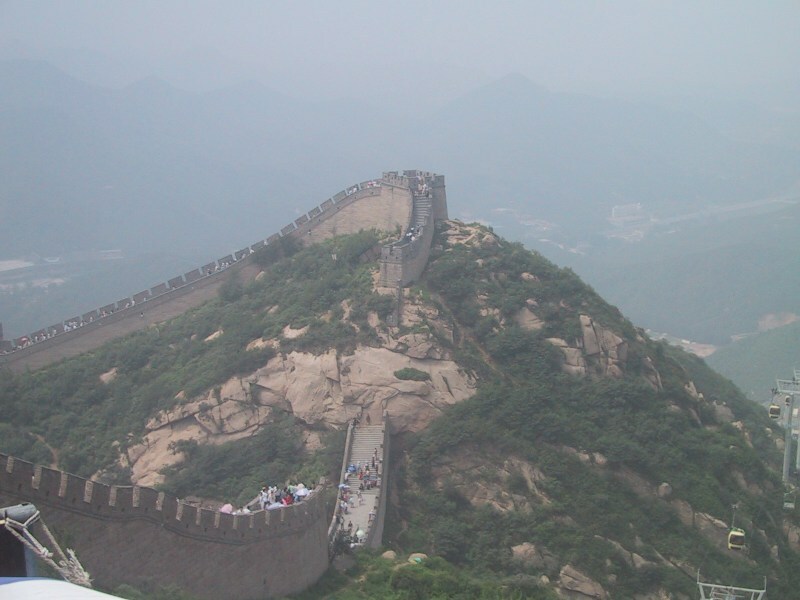 This is the most popular part of the Great Wall, and it sees quite a bit of tourist traffic. 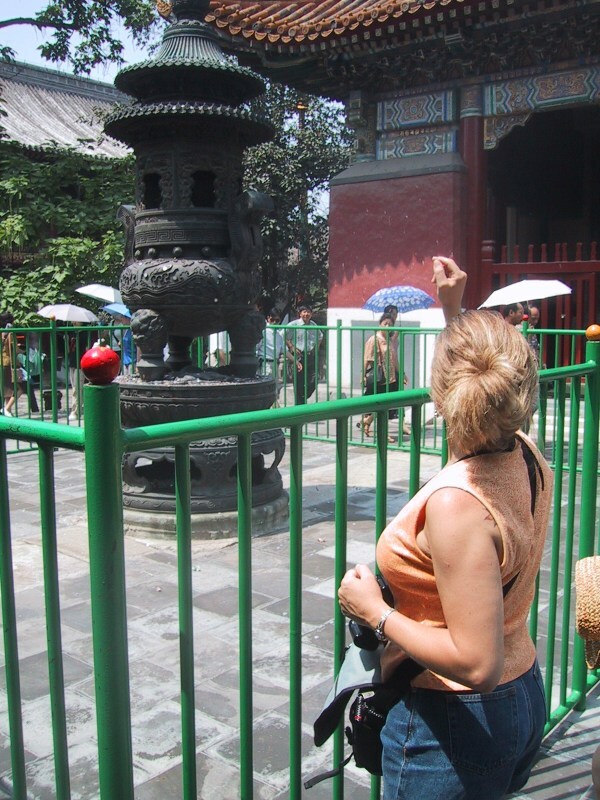 It is easily accessible, with a cable car to take you up and back. 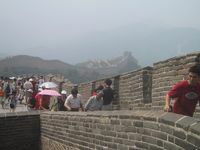 Crowds on the Great Wall. The hot, muggy, heavy air didn't allow us to see very far. 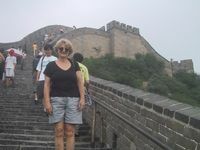 Here's Donna posing on the Wall. 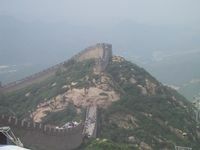 If you look closely you can see some of the zillions of dragonflies that were buzzing about the Wall. 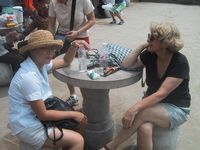 Nancy and Donna are having a break and a chat, oh yeah, and ice-cream, before getting on the chair lift for the ride back down. 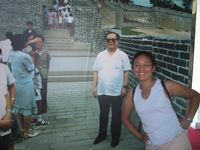 Jiang Zi Min (China's President) was at the wall the day we were there and Nancy managed to fight her way through the security guards and pop her head in for a quick photo. 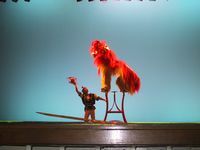 Isn't he a tiny man? 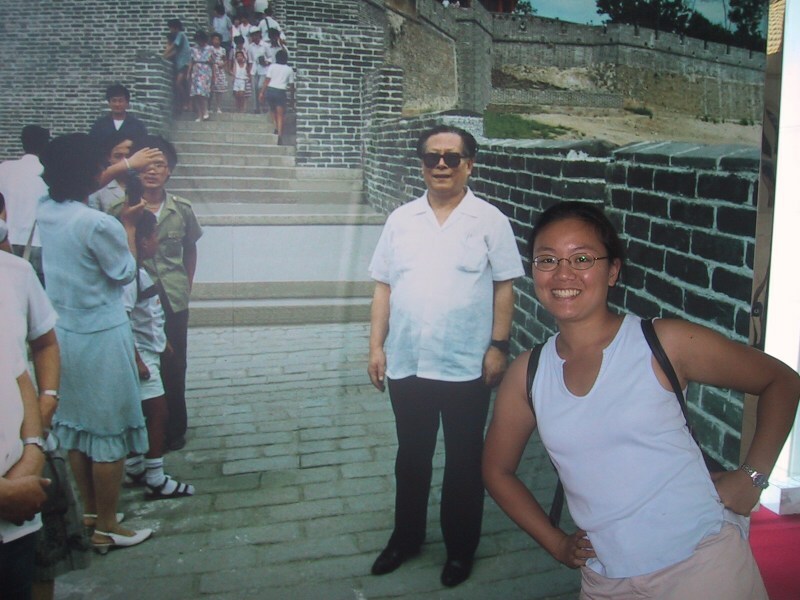 Just kidding - actually there was a museum at the bottom of the wall which had, amongst many exhibits dealing with the history and extent of the wall all over China, some almost-life-sized photos of some of the celebrities that had visited the wall. 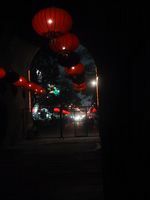 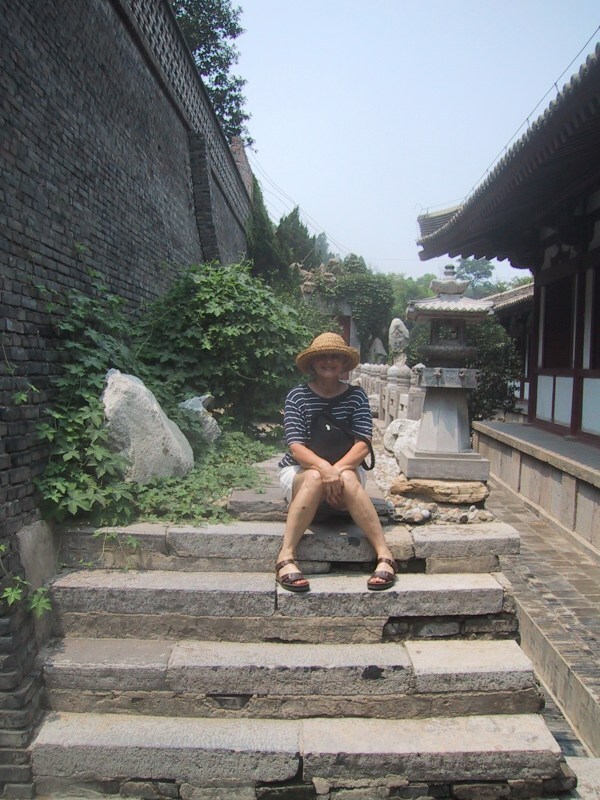 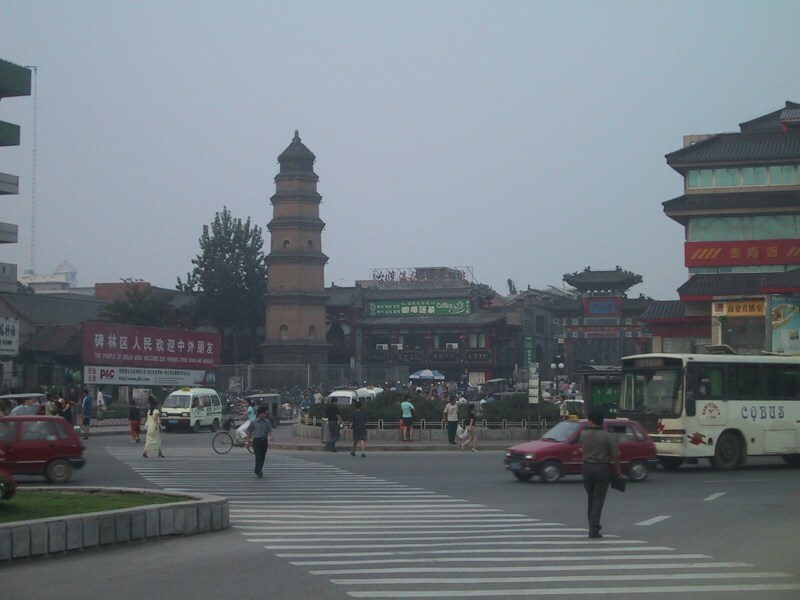 We decided to take a trip-within-a-trip, to Xi'an, in central China. 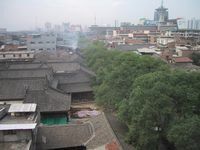 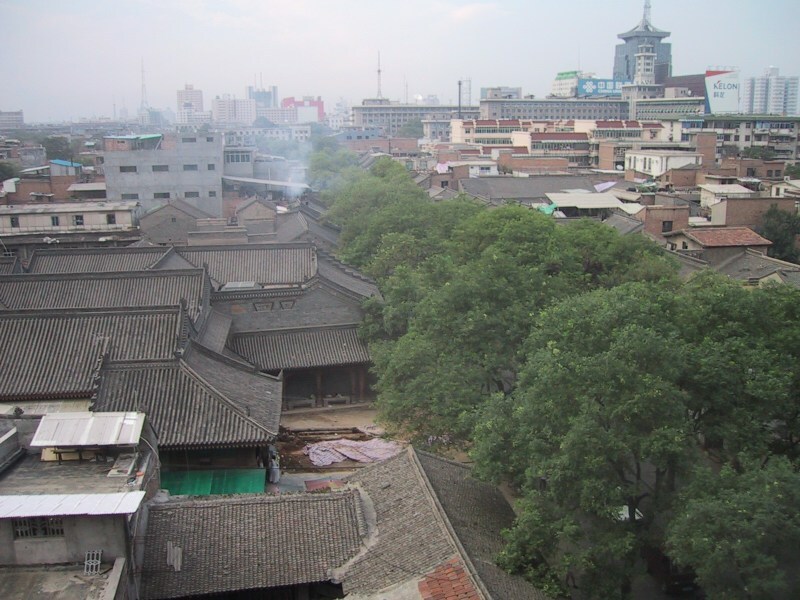 Xi'an is a very ancient city of China - one of the earliest big cities - and was one of the original capitals of the Han dynasty. 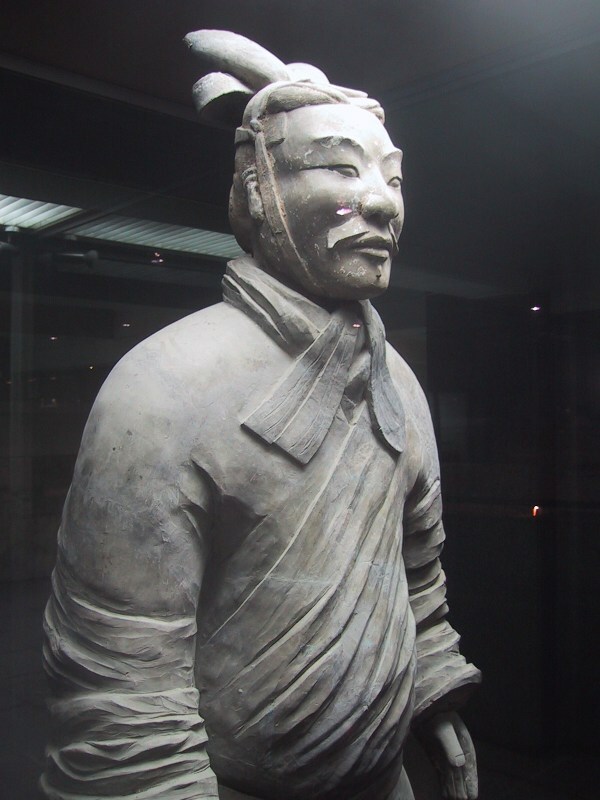 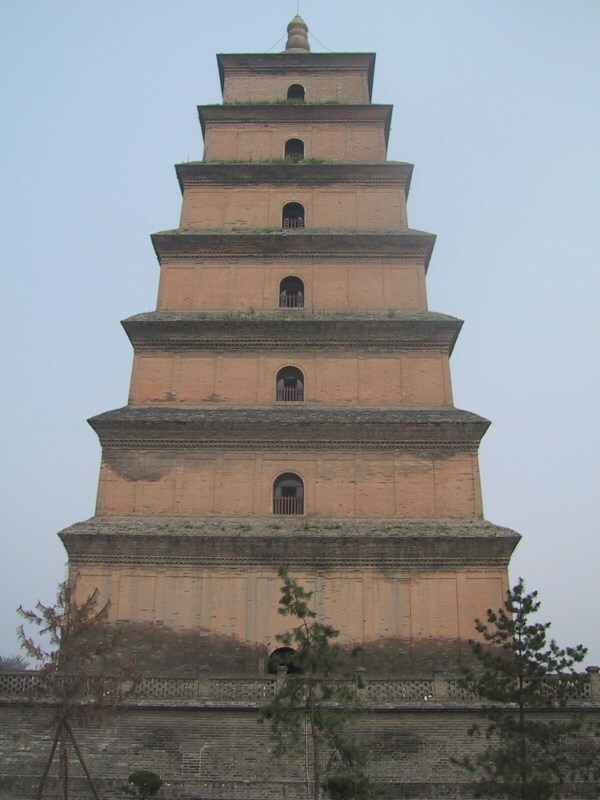 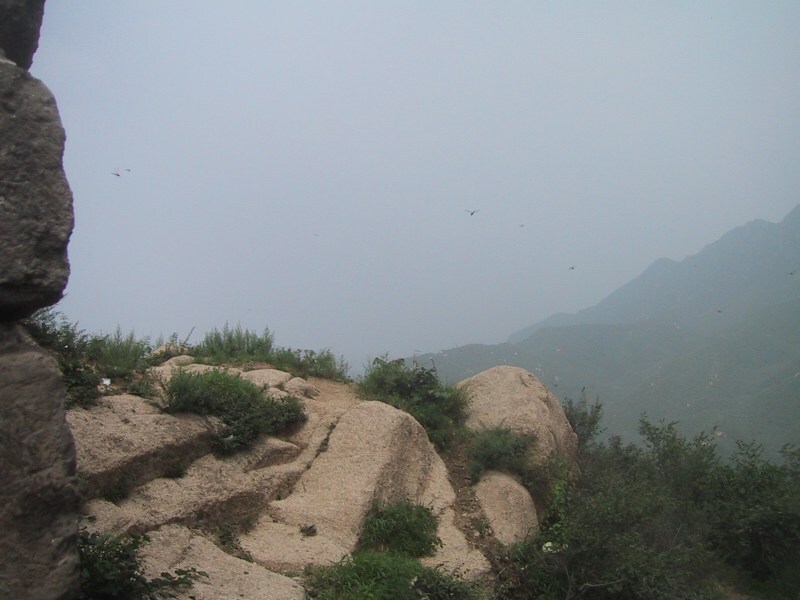 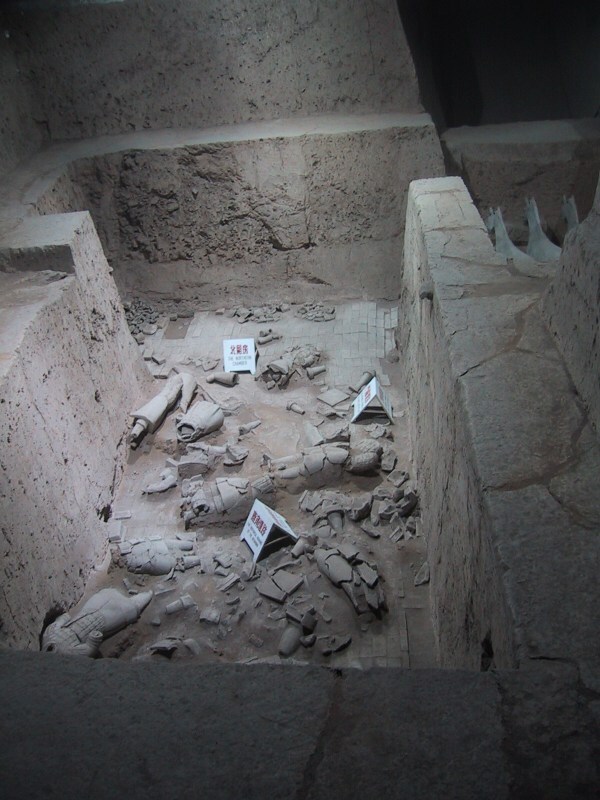 The first emperor of unified China, Qin, ruled from Xi'an, and has a large burial site near the city - they literally built a mini-mountain in which to place his remains when he died over two thousand years ago. Our mode of transport to and from Xi'an were good old reliable Chinese long-distance overnight trains. 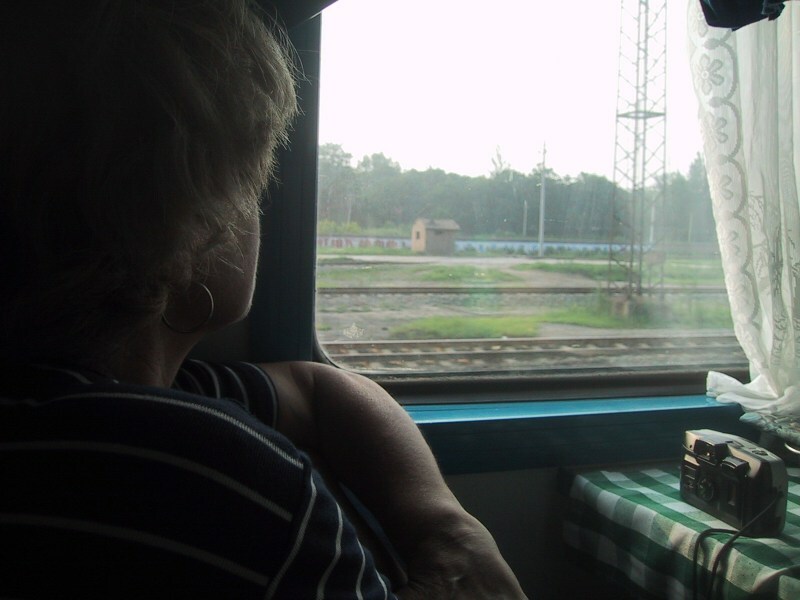 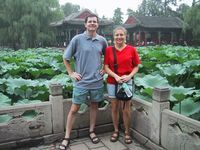 As with our other overnight train experience, from Wuhan to Beijing, the train was very convenient, easy, comfortable, and cheap. 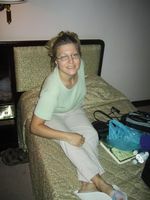 Here's Heather getting ready for bed on the top bunk. 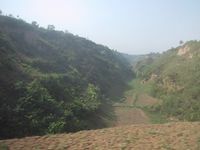 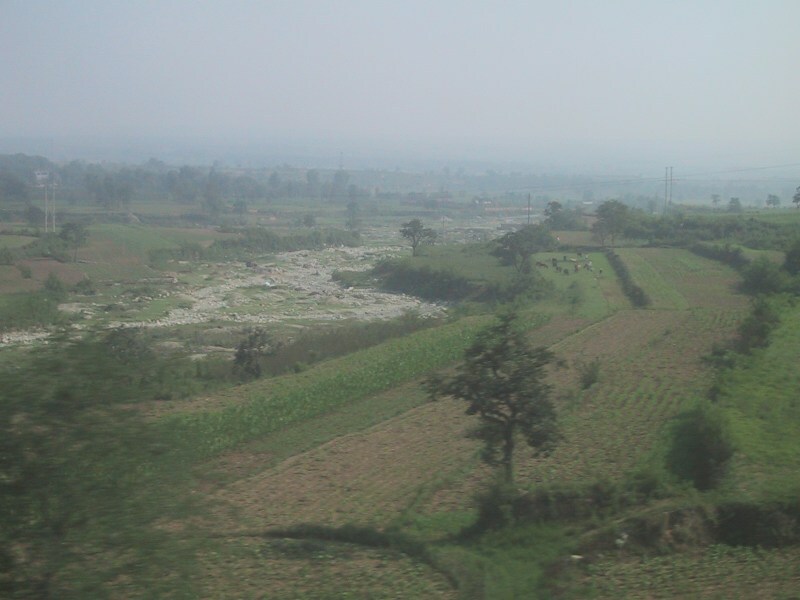 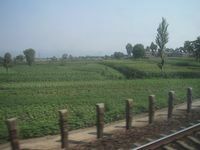 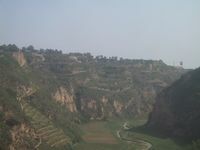 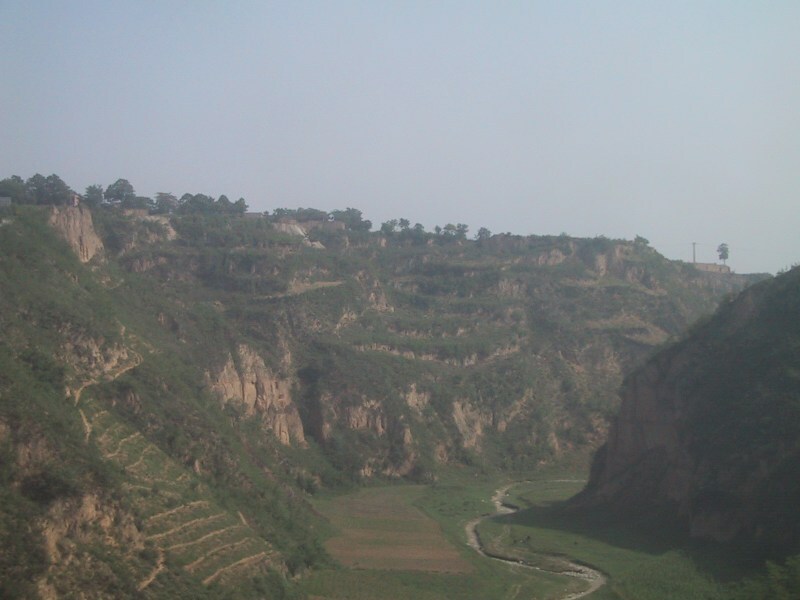 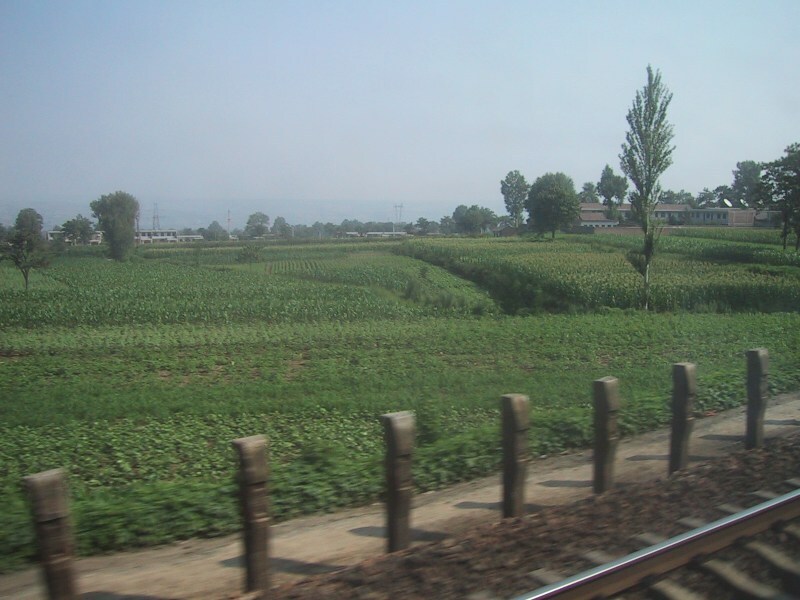 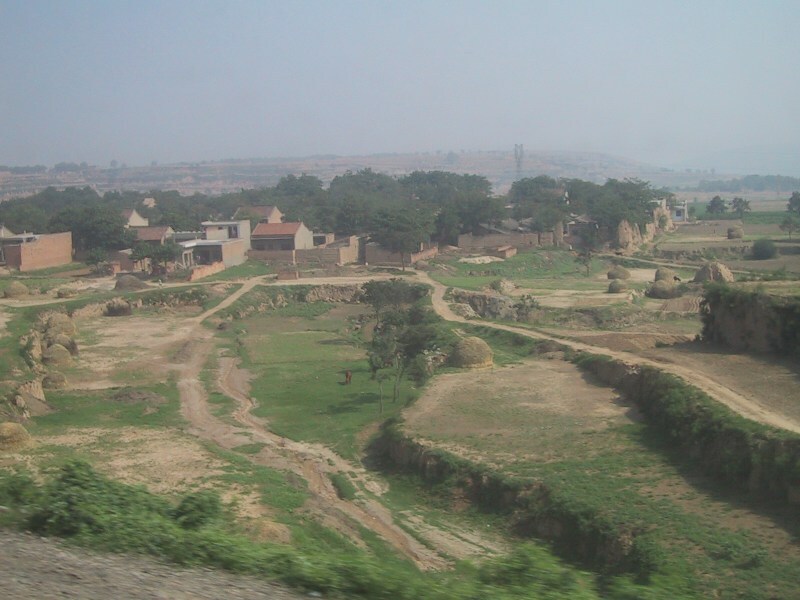 This is the landscape of central China as seen from the train, several hours from Xi'an. 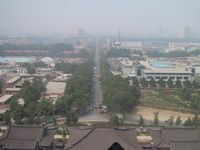 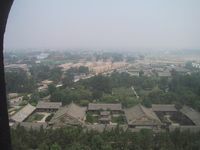 And here's the city of Xi'an itself as seen from various vantage points on a temple that we visited at the center of the city. 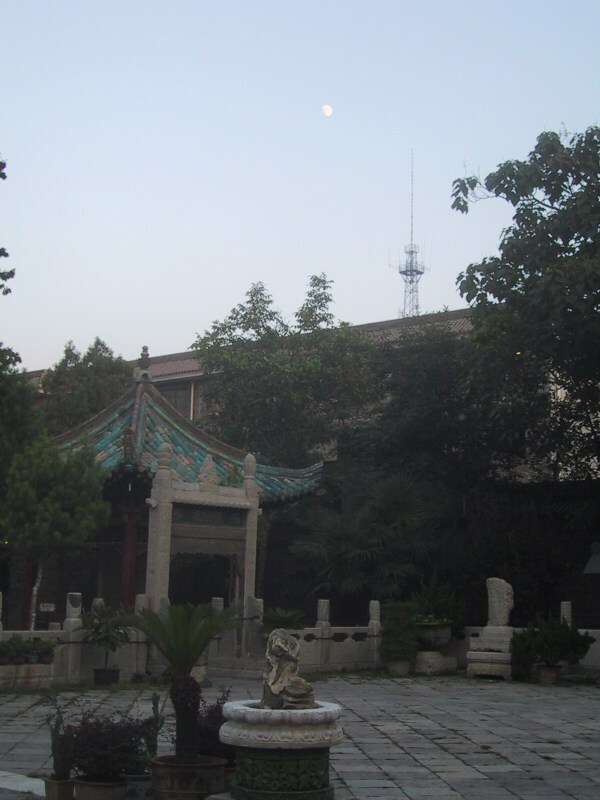 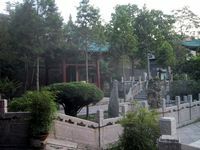 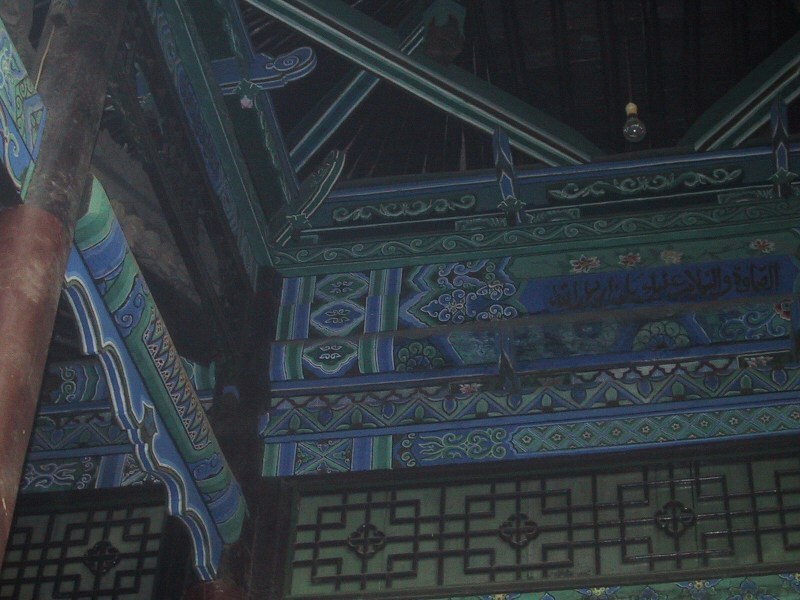 We decided to visit the muslim temple of Xi'an, one of the rare muslim temples of mainland China. On the way, we stopped to buy some souvenirs. 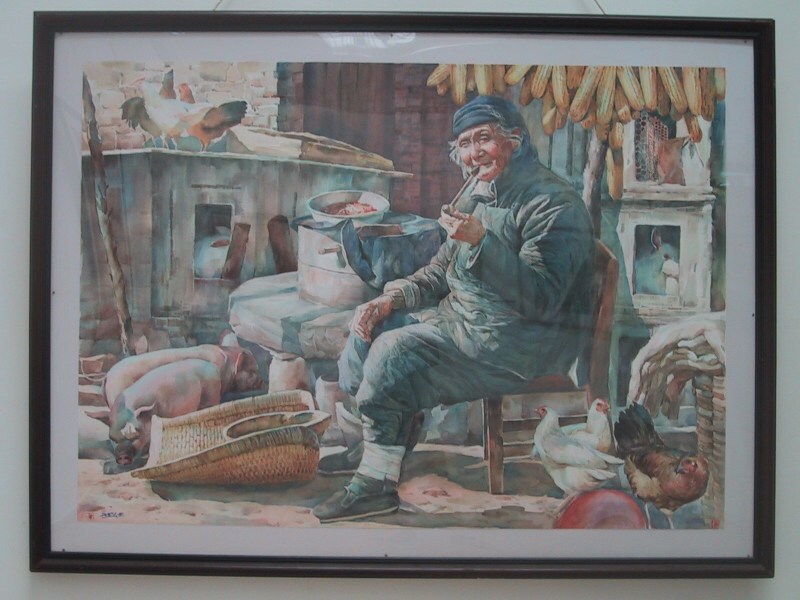 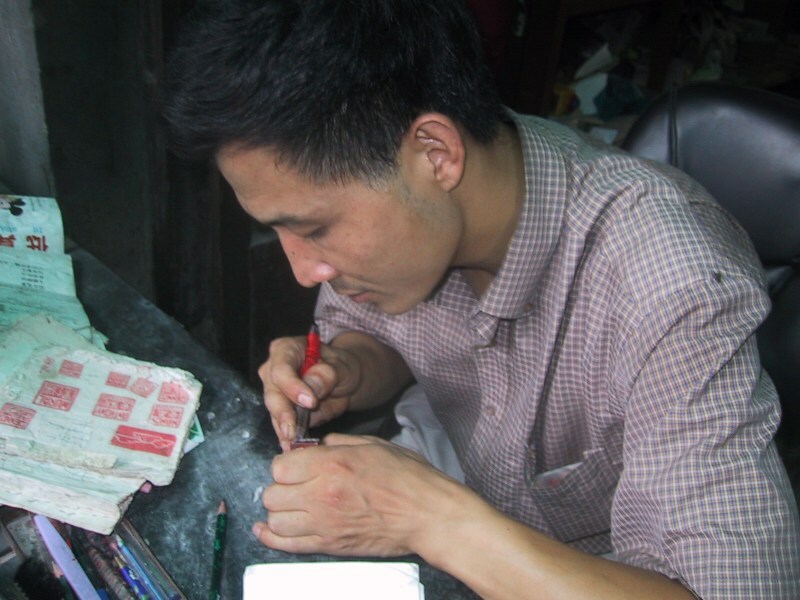 We bought a ming zhang ("Name Chop") for Erika - here's the vendor inscribing her name on the bottom of the chop. 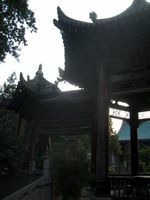 The temple consists of several courtyards in an L-shaped arrangement, with ornamented gates separating each courtyard from the next. 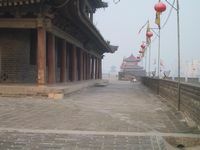 At the end is the actual temple itself. 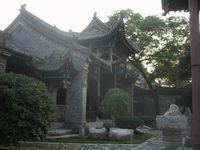 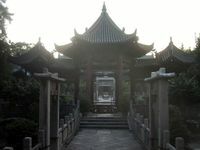 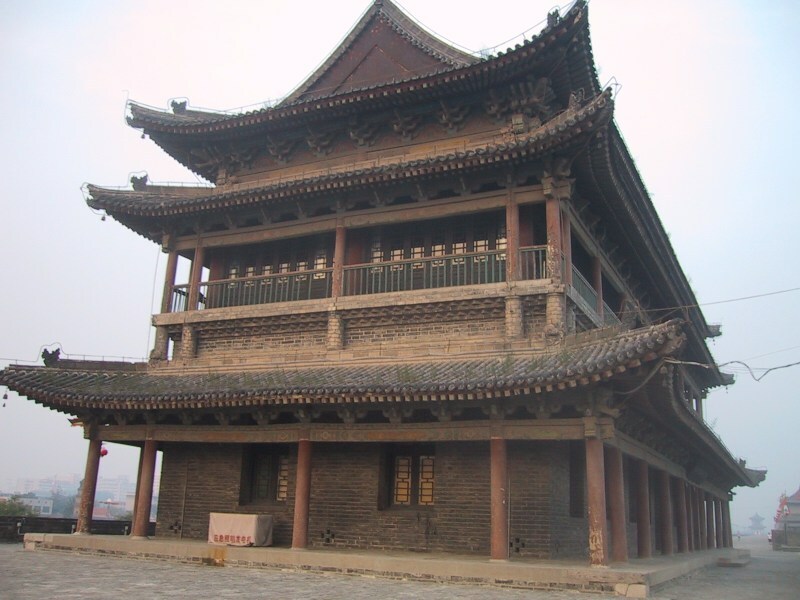 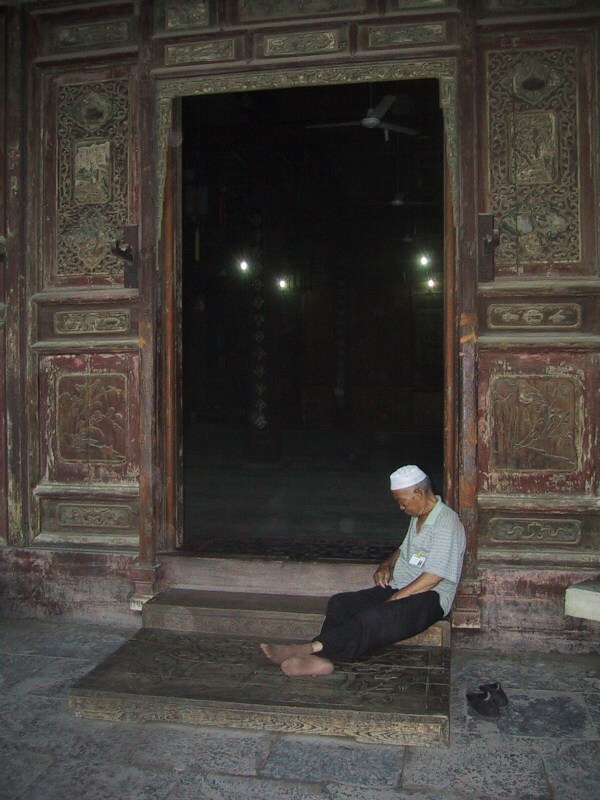 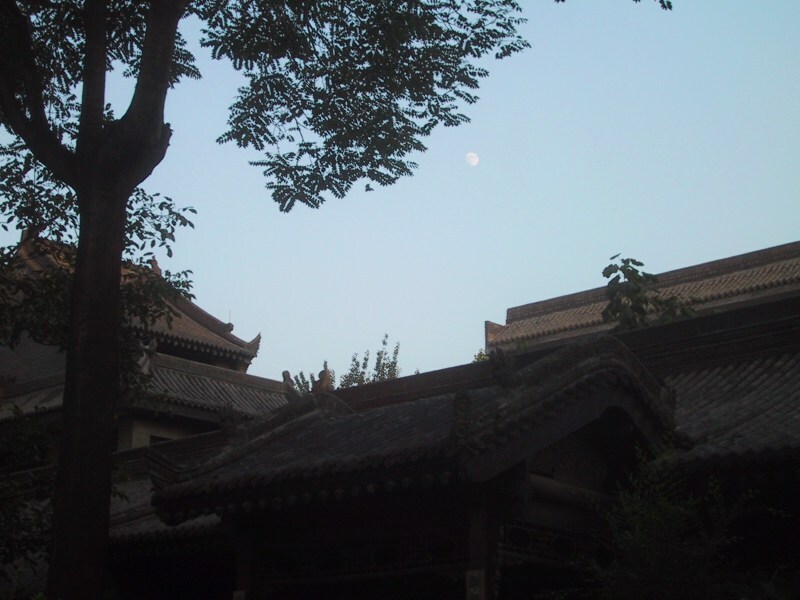 Highlights and details of the muslim temple of Xi'an. Here's a great shot of the moon over the temple roof. Unfortunately, we couldn't go into the temple itself - only worshipping muslims in appropriate attire are allowed. 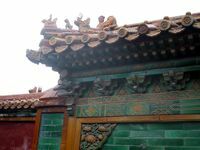 We couldn't even get a good look inside, which was unfortunate, because we were curious to see the inscriptions inside. 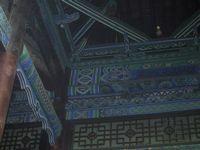 The text of the entire Koran is inscribed along the walls of the inside of the temple, but we could only see a hint of it in the fading afternoon light. 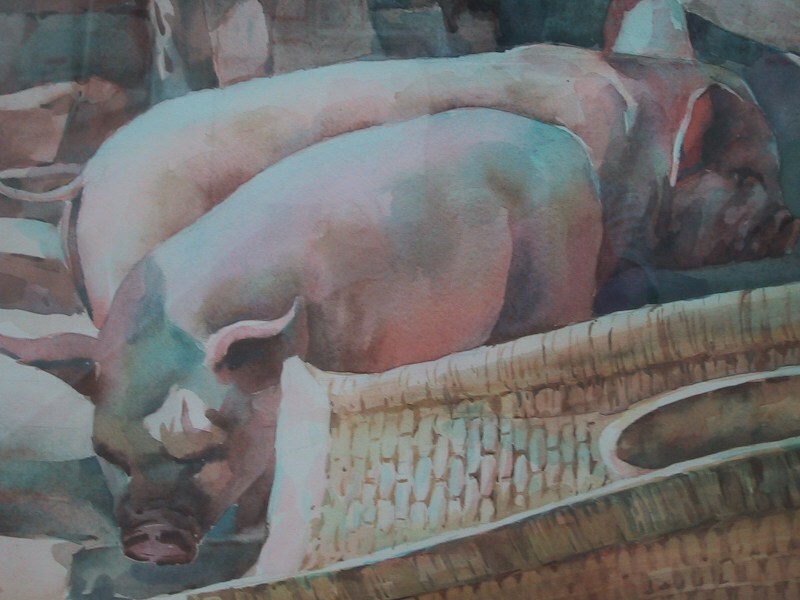 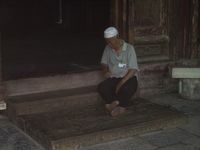 At the entrance to the temple, the temple attendant snoozed comfortably. 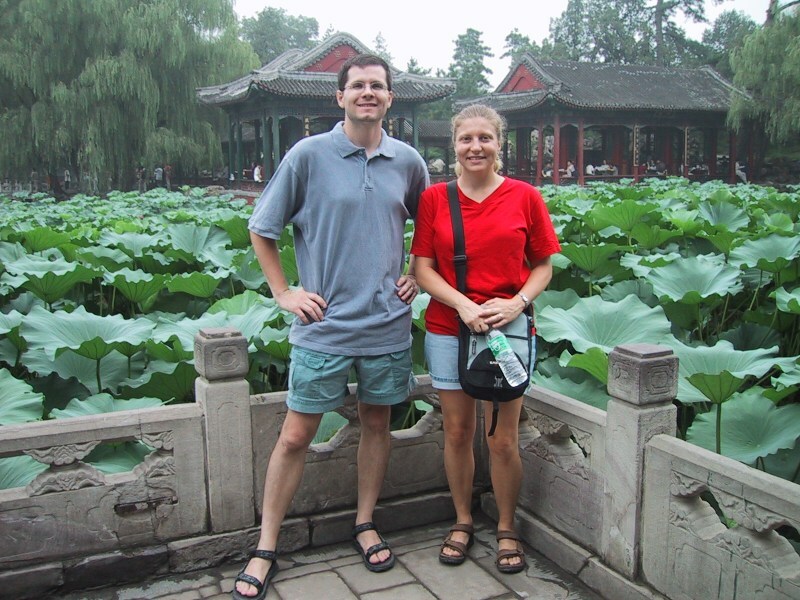 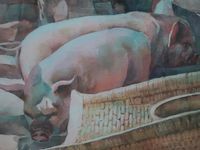 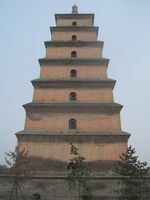 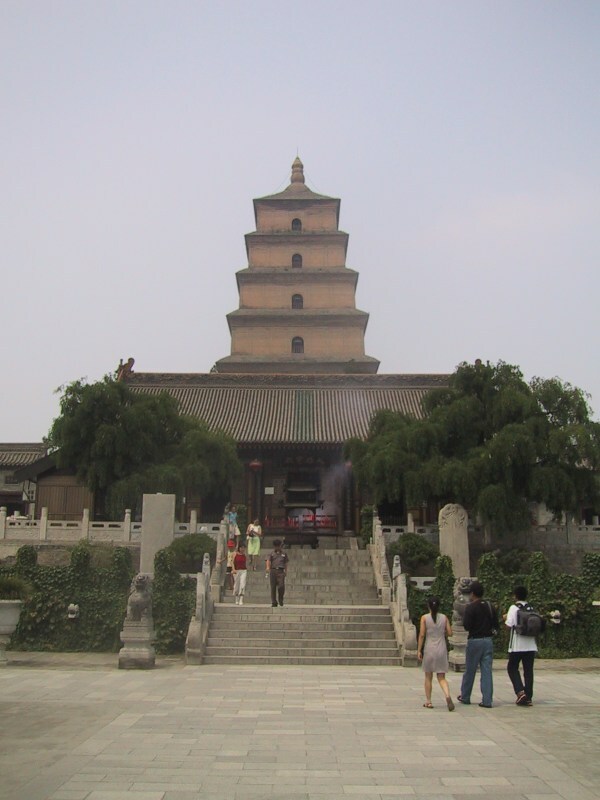 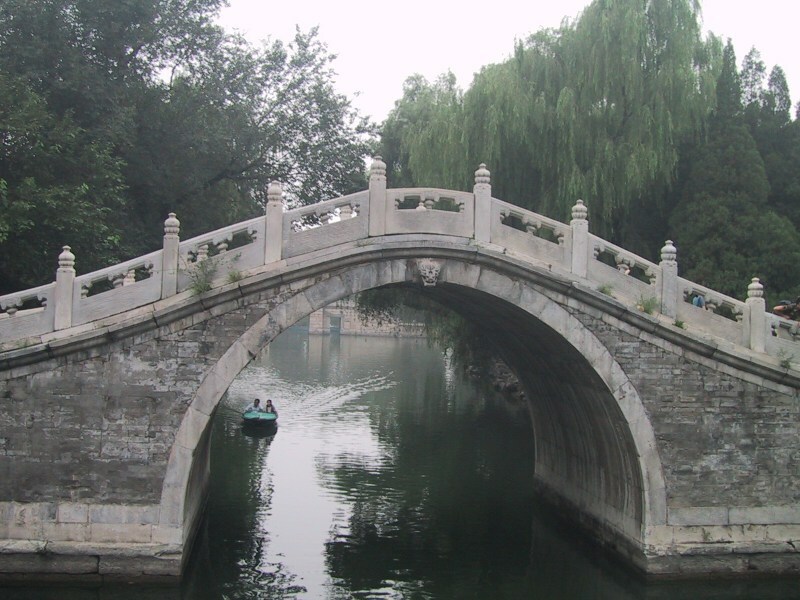 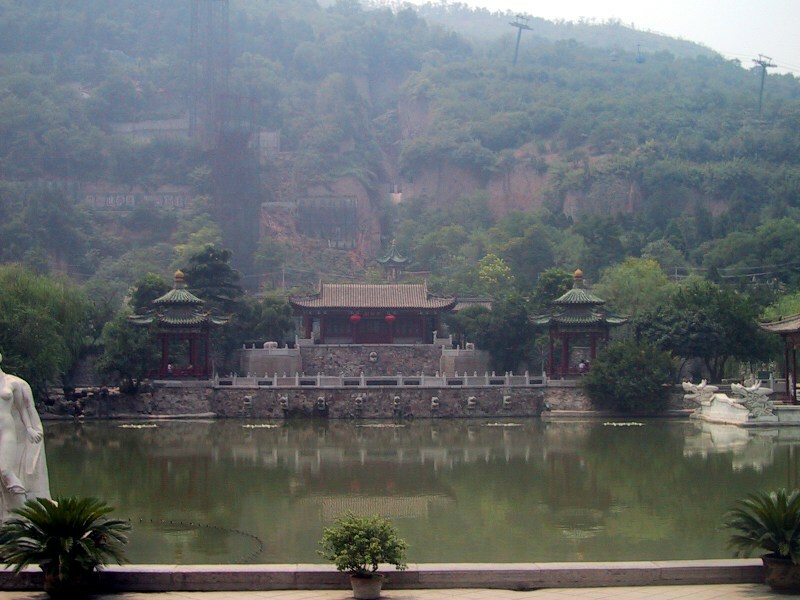 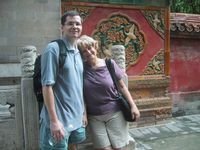 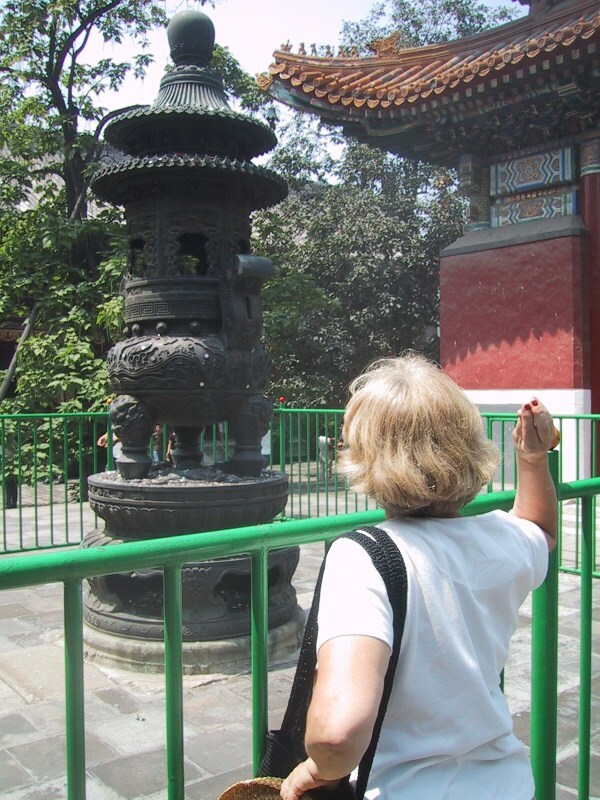 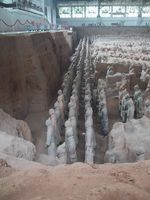 Because there are so many sights to see outside the city of Xi'an, we booked a one-day tour to take us to see it all. The main attraction was the Terracotta Warriors, but we also stopped at several other interesting attractions along the way. Our first stop was an archaelogical site in which an acient village has been unearthed and is on public display. Our tour guide was very informative and filled us in on all of the details of life in this ancient village, as determined by the work of Chinese archaeologists. 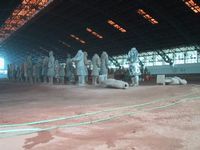 This is the main chamber of the three chambers consitituting the site. 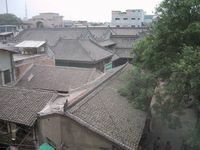 Huts once stood on the circular pits. 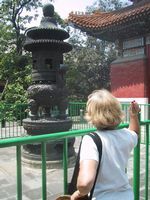 The guide told us about the round earthen pots that they used to make. 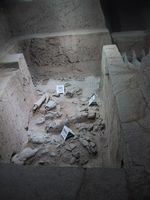 The pots were quite small and the guide told us that when if a baby died, the mother would put the baby into a pot and keep it near the house for some time to care for it as if it were still alive. 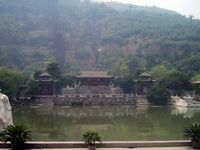 Next we were taken to a famous hot springs mountain. These springs were used by the emperor for bathing and relaxing during week-long visits several times each year. 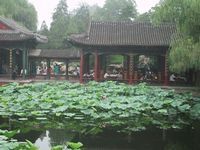 There was a famous concubine which accompanied him on many of these trips and several statues and monuments to her can be found at the site. 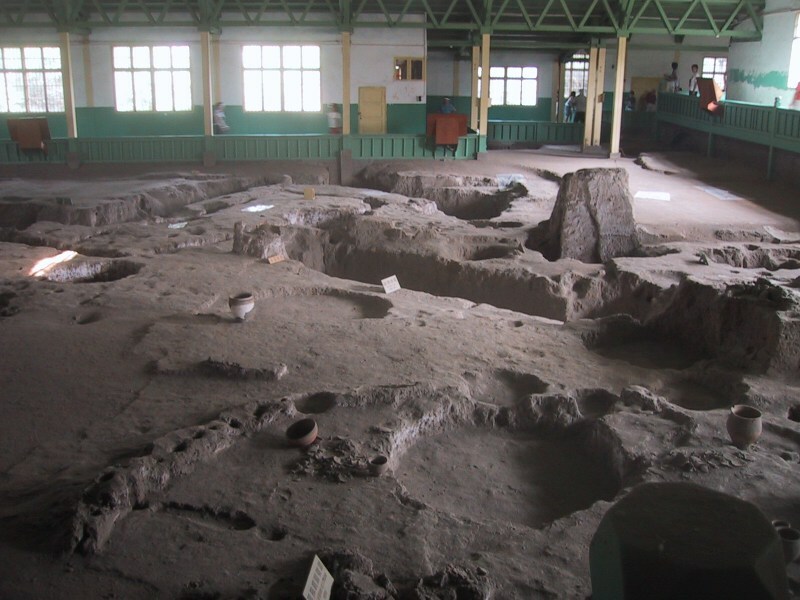 All of the baths themselves, where the hot spring water was originally collected, were dry, so there wasn't too much to see other than some temple-like buildings with stone pits in the middle. 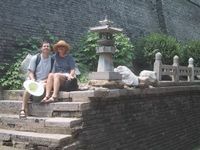 Bryan and Donna took this opportunity to take some pictures in a quiet spot next to one of the bath houses. 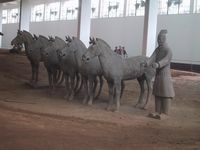 After lunch we continued on to the famous Terracotta Warriors. 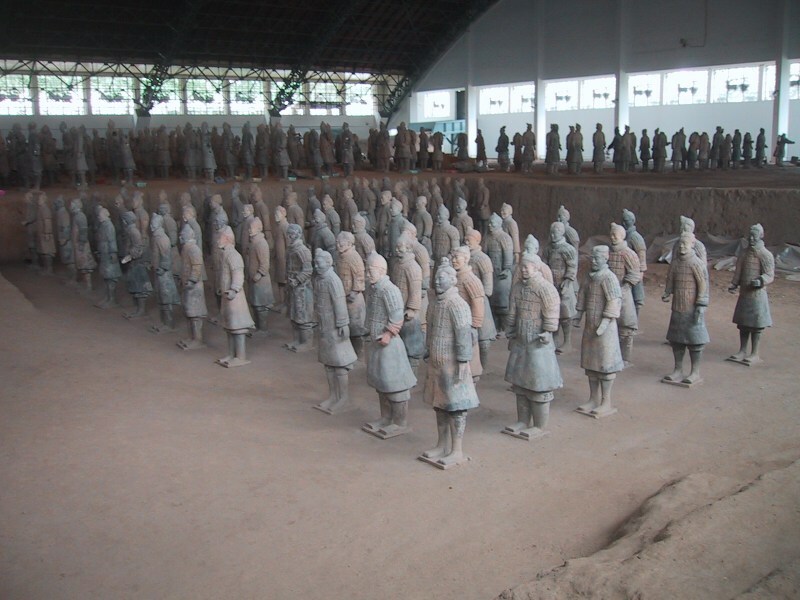 In the 1970's a farmer happened upon this underground site which had been buried for over 1,000 years, and which contains a complete army of life-sized clay soldiers. 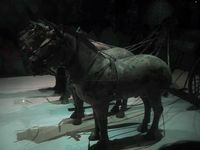 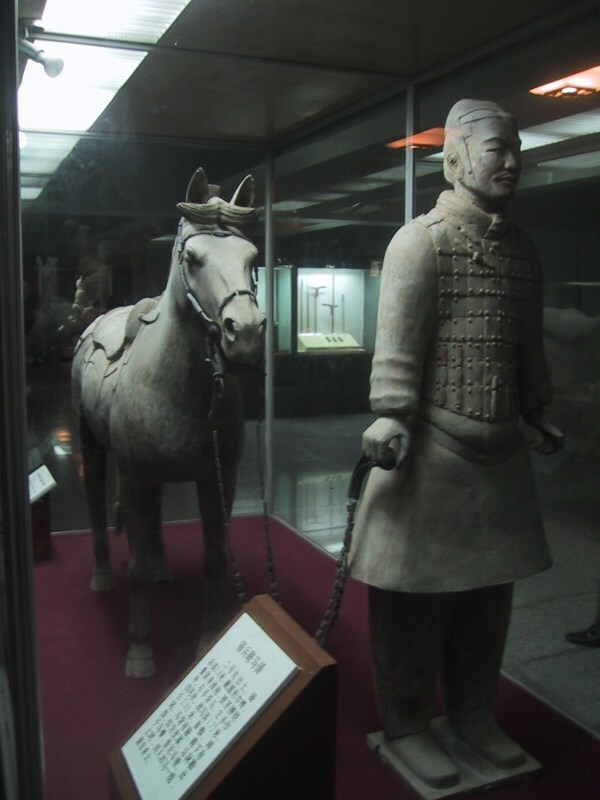 There were several bronze horses with chariots unearthed as well; these were almost life-sized, and were part of a special display behind glass. 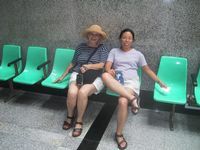 Here are Nancy and Donna taking another break. 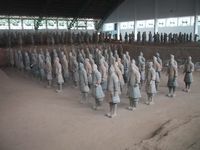 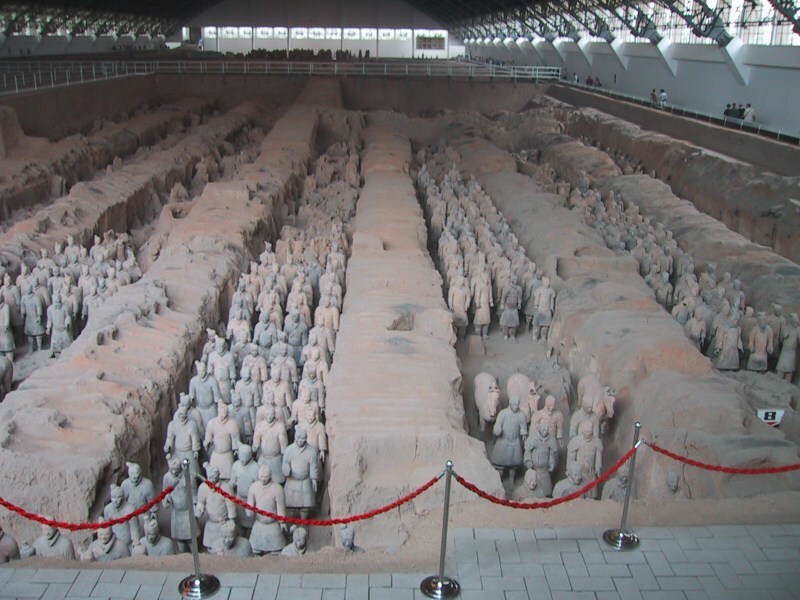 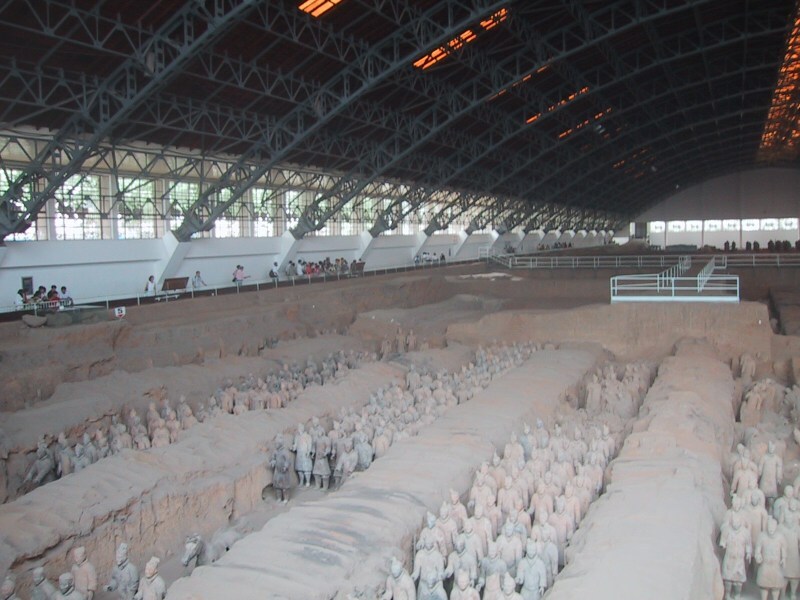 This is the site of the terracotta warriors; it consists of several trenches roughly the same length of a football field, each packed with clay warriors. 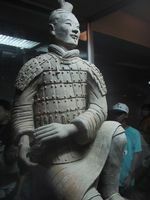 Each warrior is unique and armed with weapons and dressed in clothing according to the warrior's function within the army. 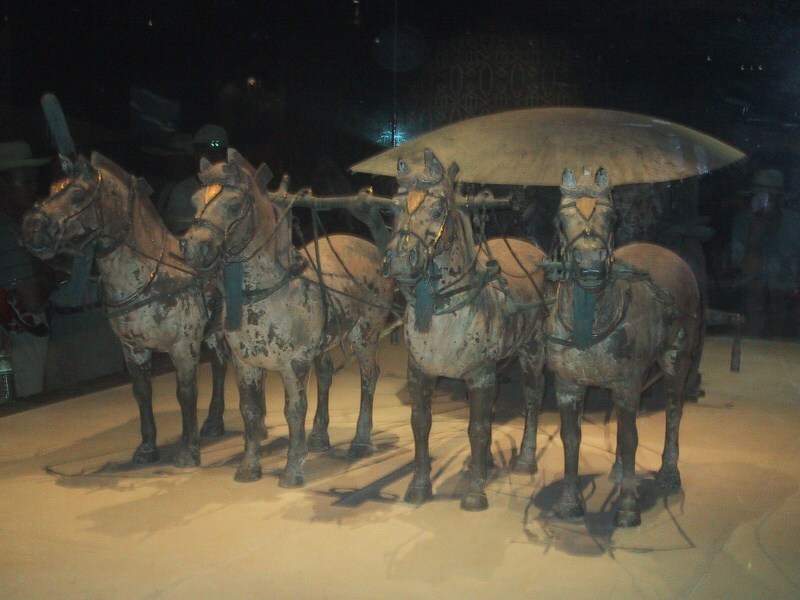 The army consists of foot soldiers, archers, chariot pilots, and officers. 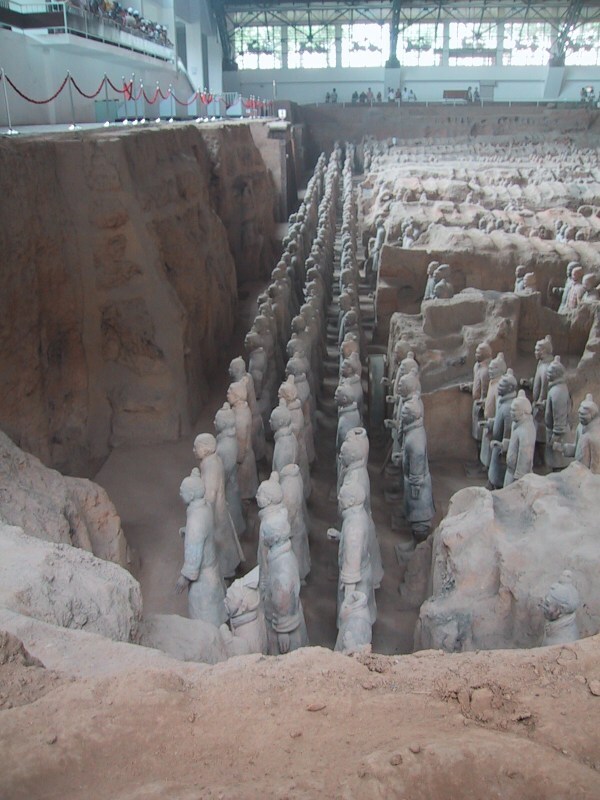 The story goes that these warriors were all constructed and put into these pits so that they could protect the emperor when he was buried. 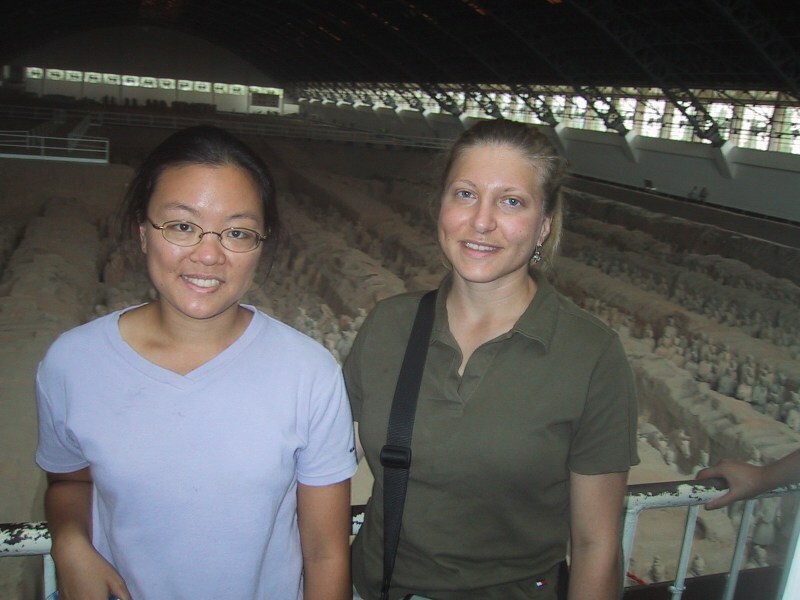 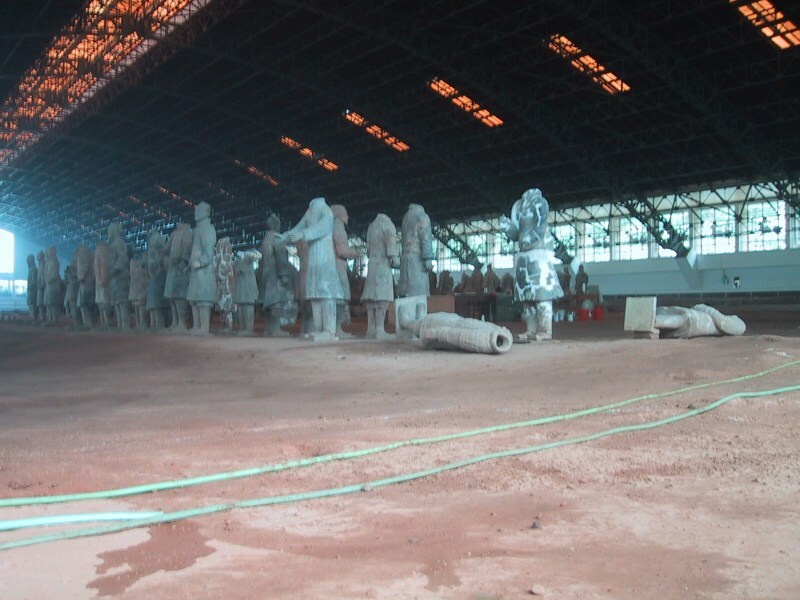 The Terracotta Warrior complex consists of several large separate areas in which different parts of the army have been uncovered. 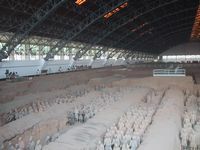 Here is a shot of one of the sites which is still being actively unearthed. 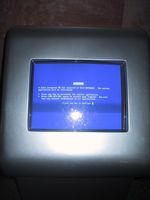 Of course Bryan couldn't resist getting a picture of the Windows blue screen at this kiosk. 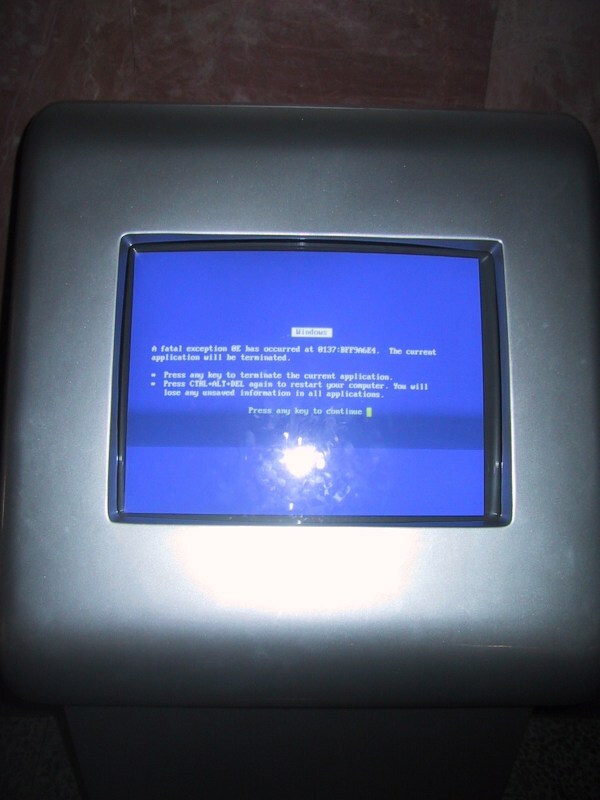 What were they thinking, using Windows for a task like this? 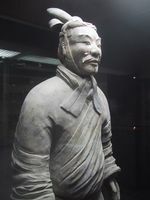 At another spot within the Terracotta Warrior complex we were able to get a close-up look at some of the best-preserved warriors, carefully excavated and preserved behind glass. 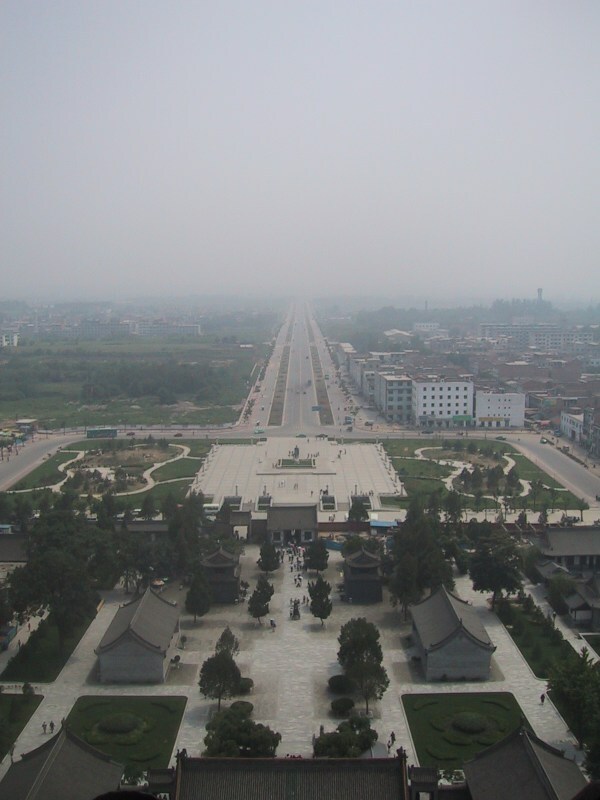 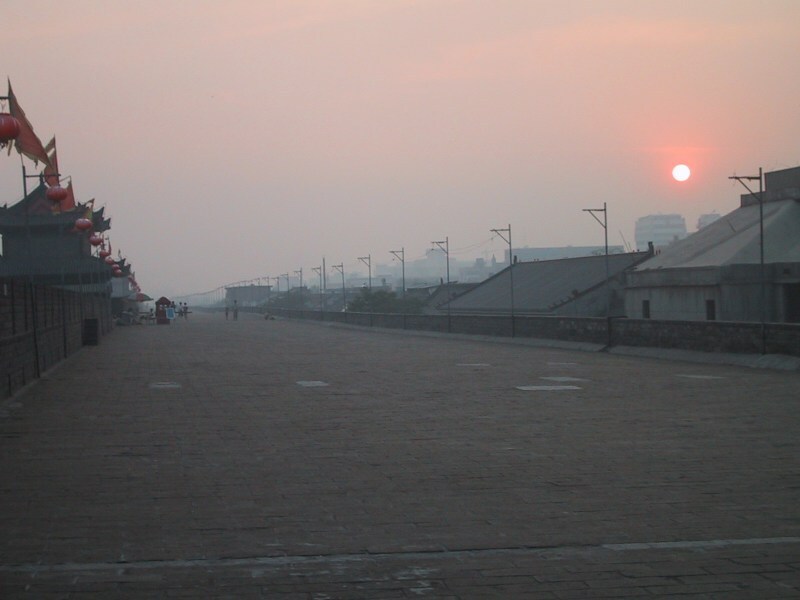 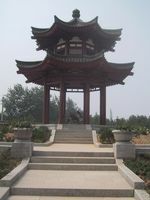 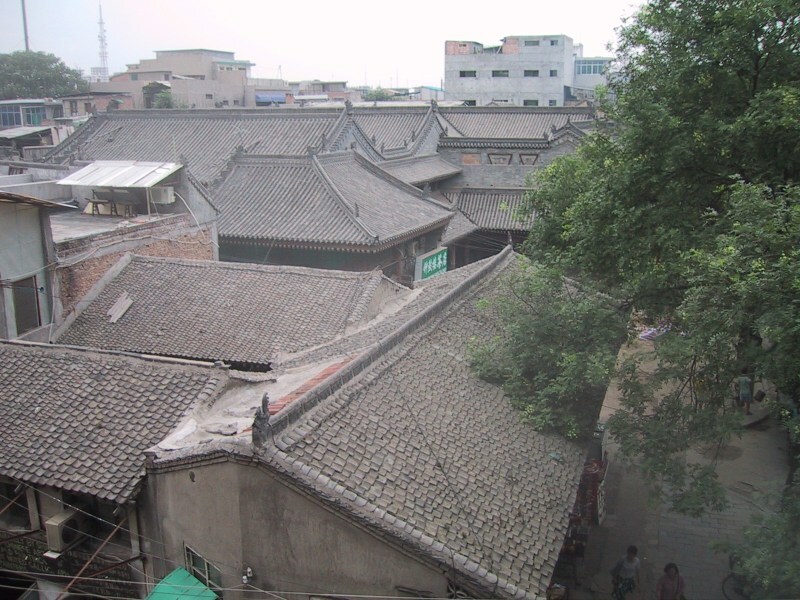 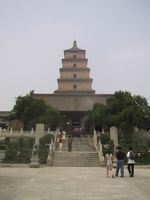 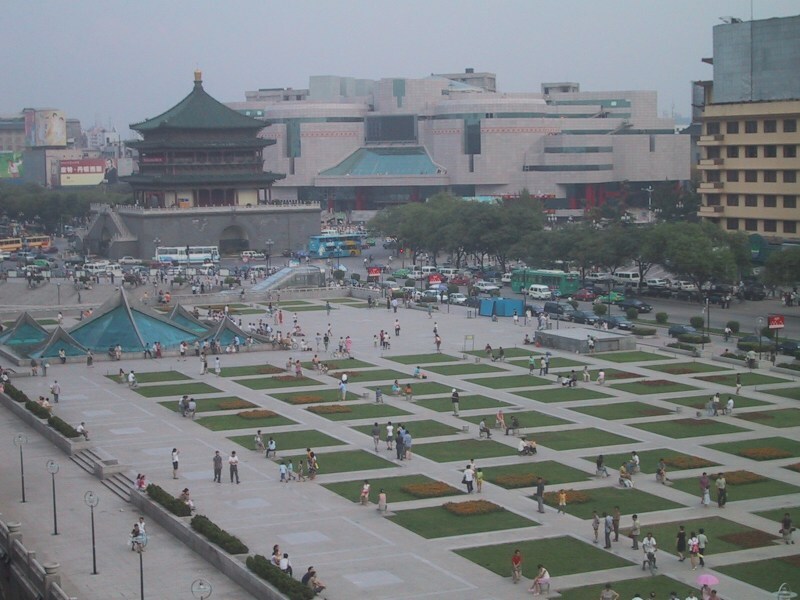 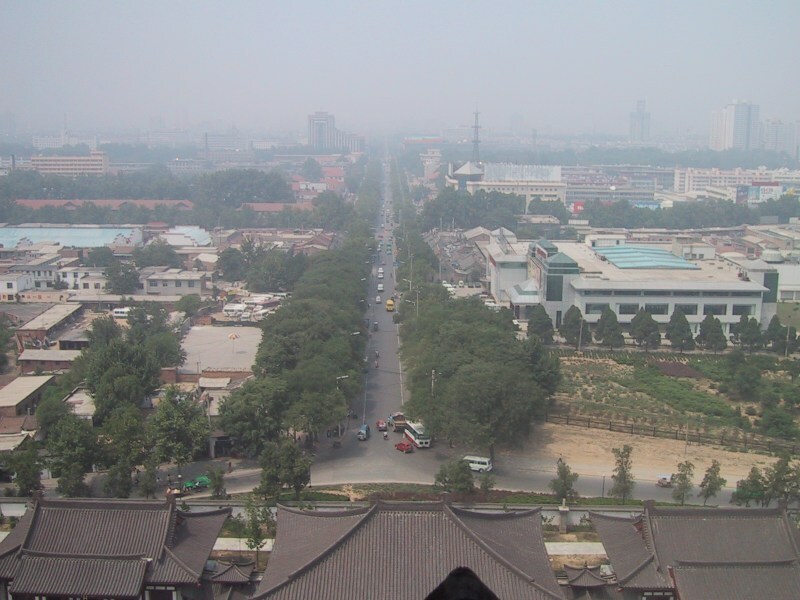 Here's a picture of one of the central squares of Xi'an. 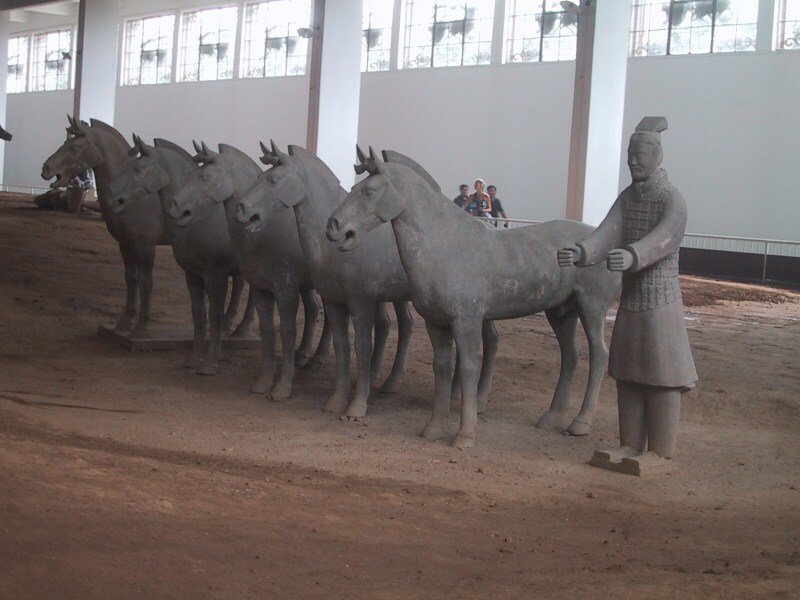 Xi'an has a huge, imposing wall surrounding the city; we were told that four horses could walk abreast on top of the wall; when we reached the top of the wall it became clear that it was wider than even that - at least 10 horses could walk abreast on this wall. 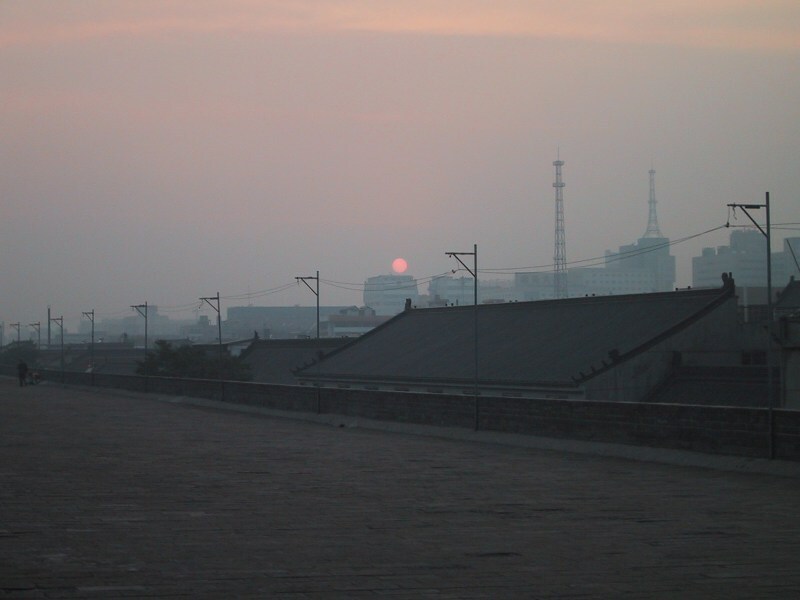 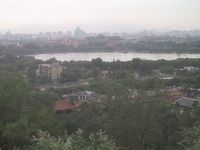 We spent quite some time standing on the wall and watching the late afternoon activity of Xi'an below us. 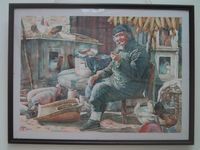 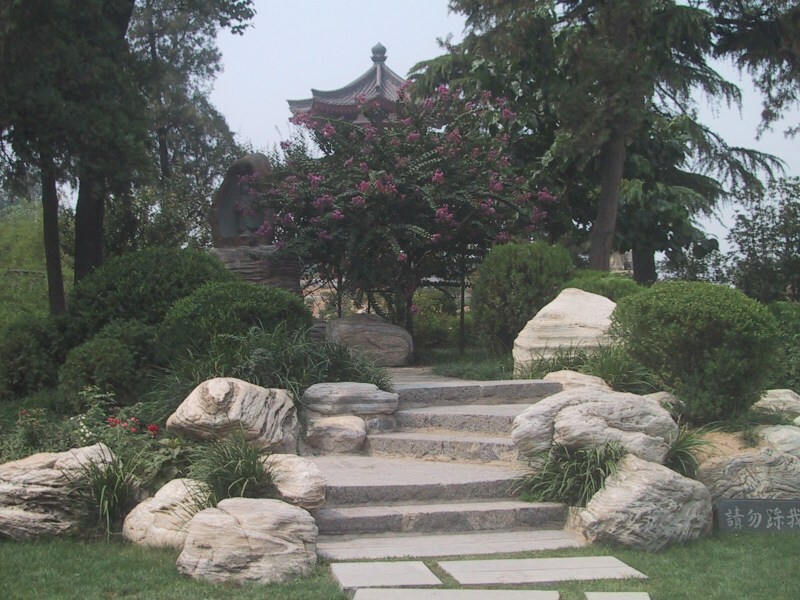 At one point on the wall, a small park could be seen below, and in typical Chinese style, a group of 10 or so elderly individuals were watering the dozens and dozens of shrubs on the edge of the park, bucket by bucket. It took a few minutes per shrub and from the looks of it they had several hours to go before they would be done with all of them. 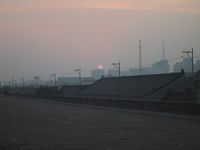 Here are some more photos taken at the wall as dusk fell. 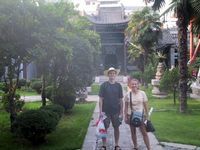 The next day we visited one of the famous pagodas of Xi'an before our afternoon departure on an overnight train back to Beijing. 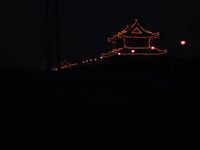 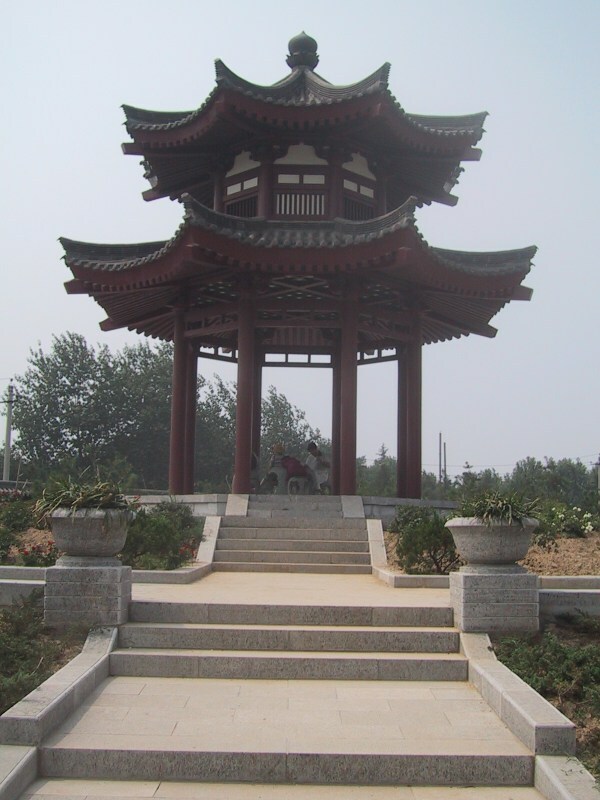 Here are photos taken in, and around, the pagoda. 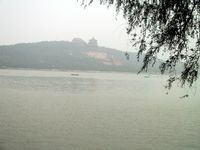 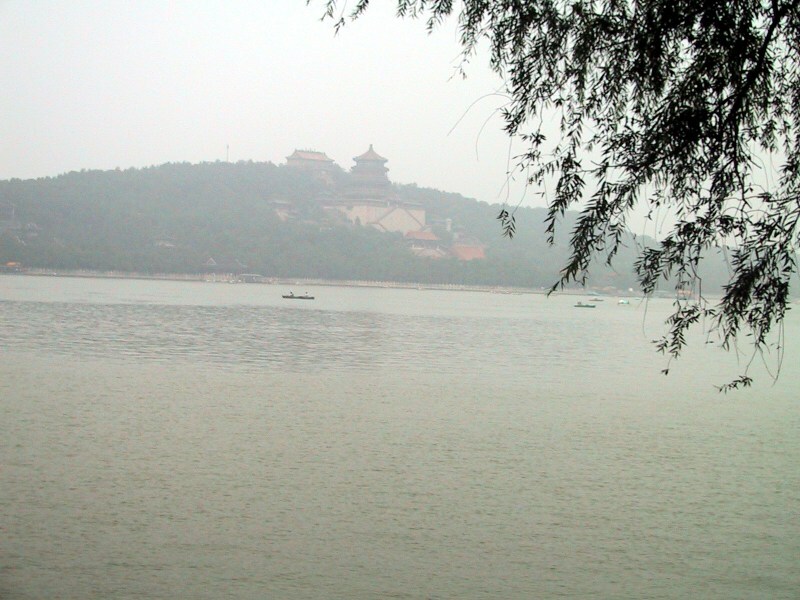 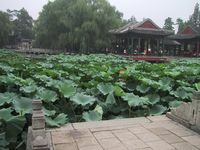 Back in Bejing, we went to the summer palace. 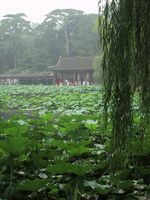 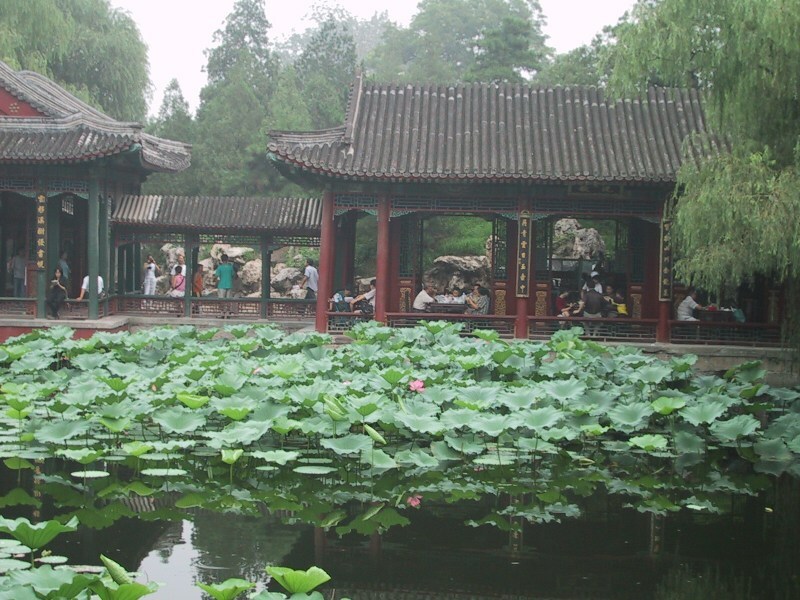 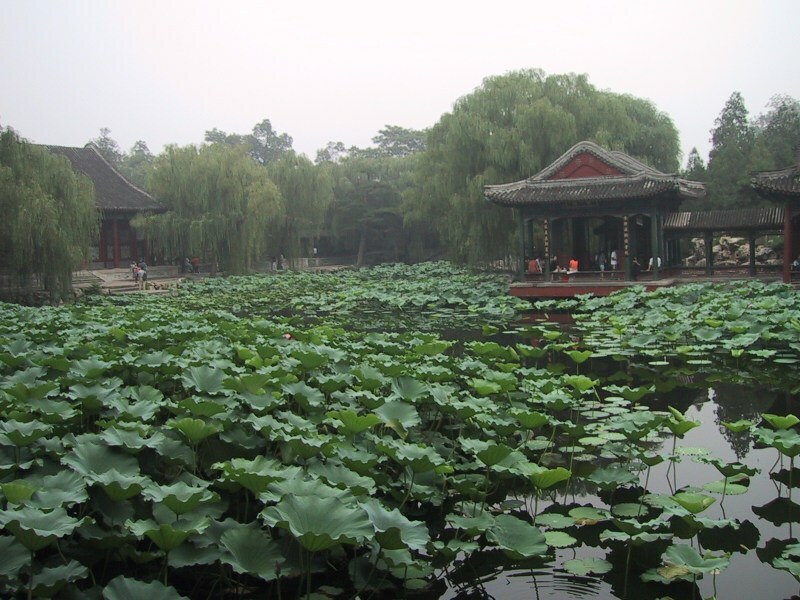 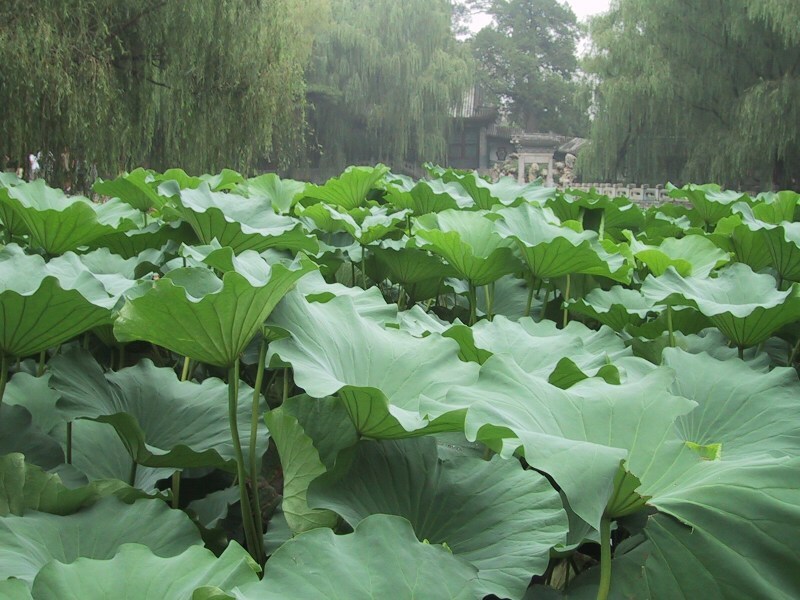 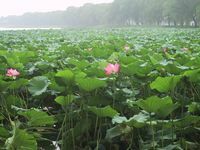 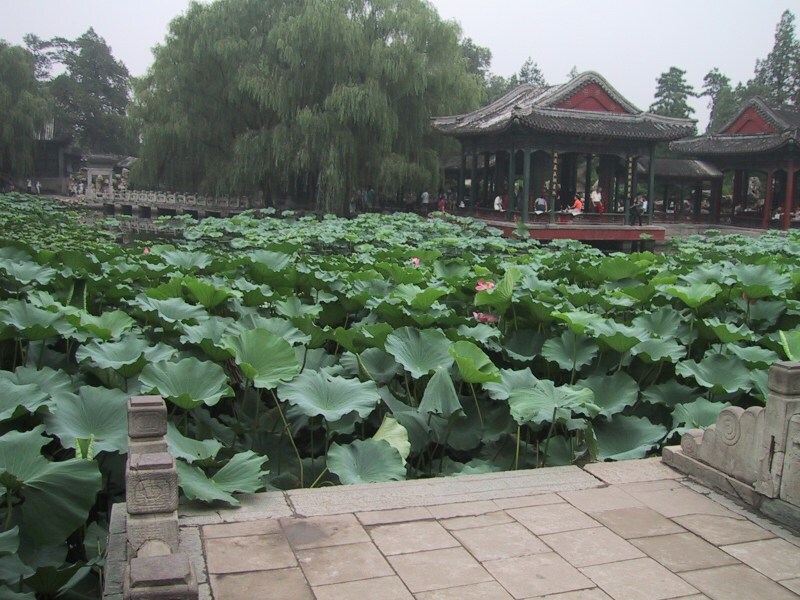 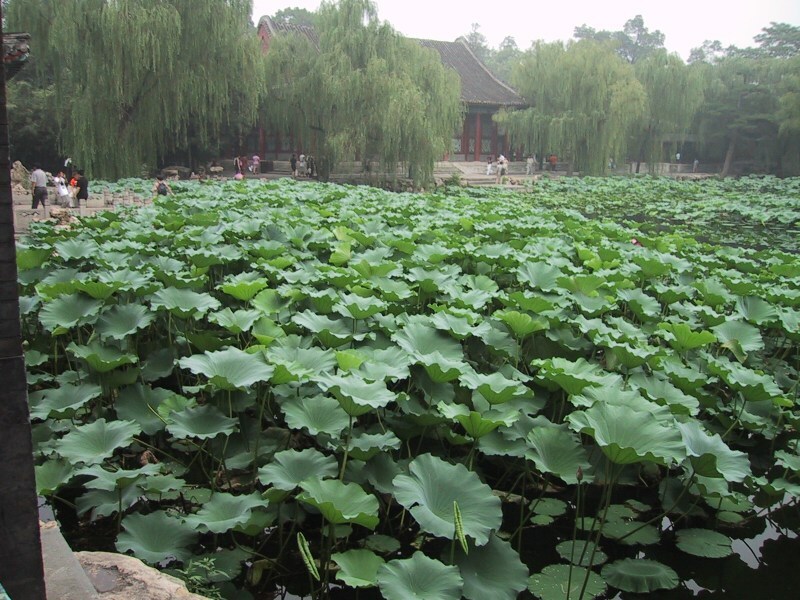 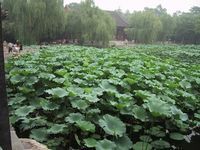 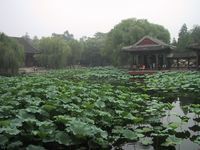 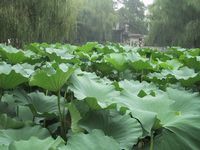 We were amazed to find that the pond that we had visited in April, was now completely overrun with lotus and lily plants! 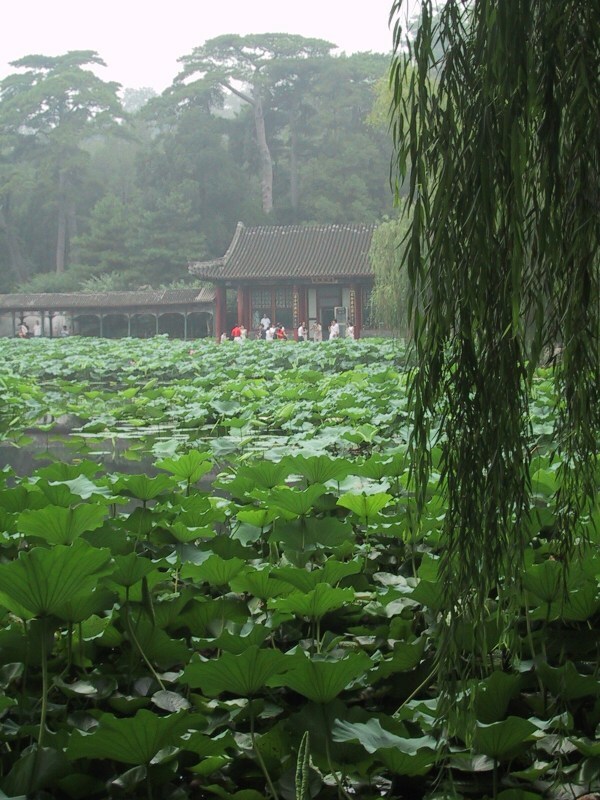 We couldn't even see the Koi anymore! 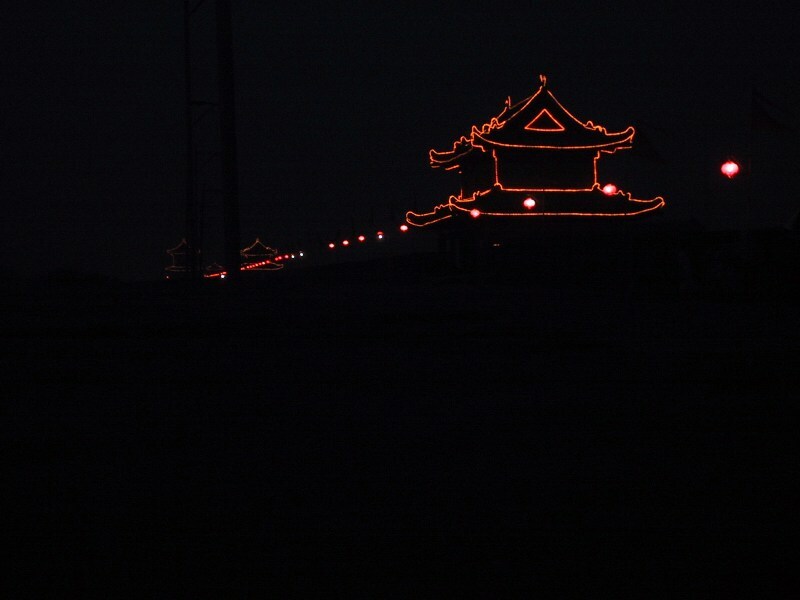 If you go back to the Summer Palace photos from Michele and Alex's visit to Beijing, you will be astounded by the difference in comparison to these photos! Here's a lovely bridge over one of the rivers within the park. We got a little lost and found ourselves far from the center of the park with no obvious way of getting back. We ended up walking for an hour before we finally emerged from a back entrance. 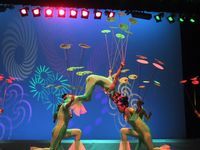 That evening we went to see an acrobatic performance. 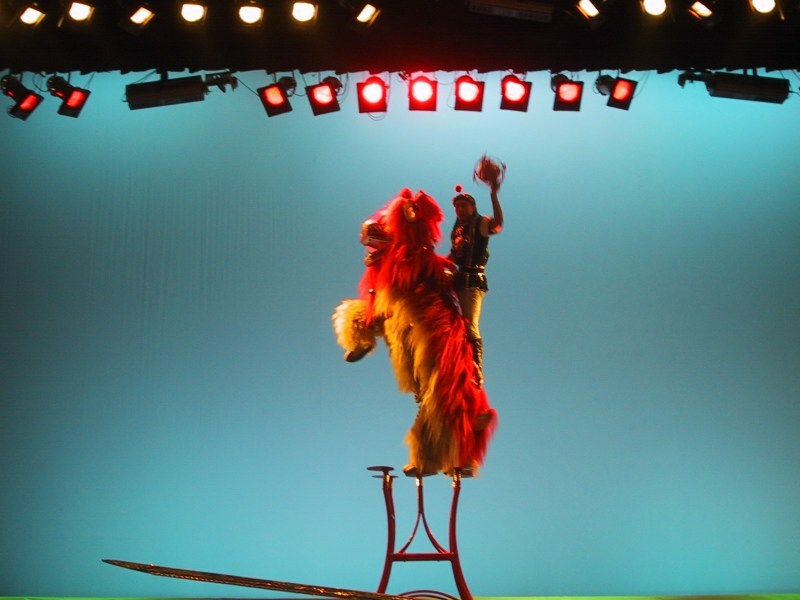 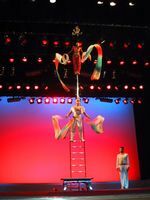 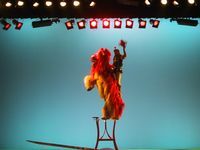 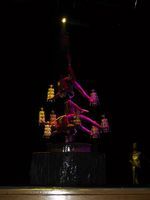 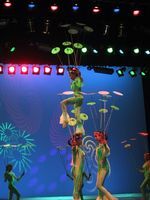 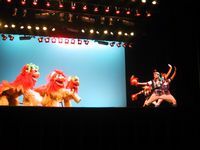 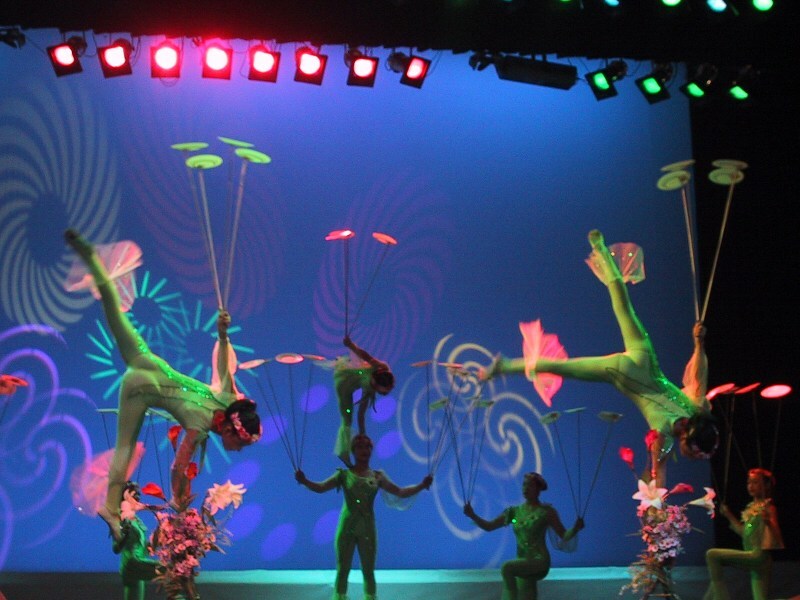 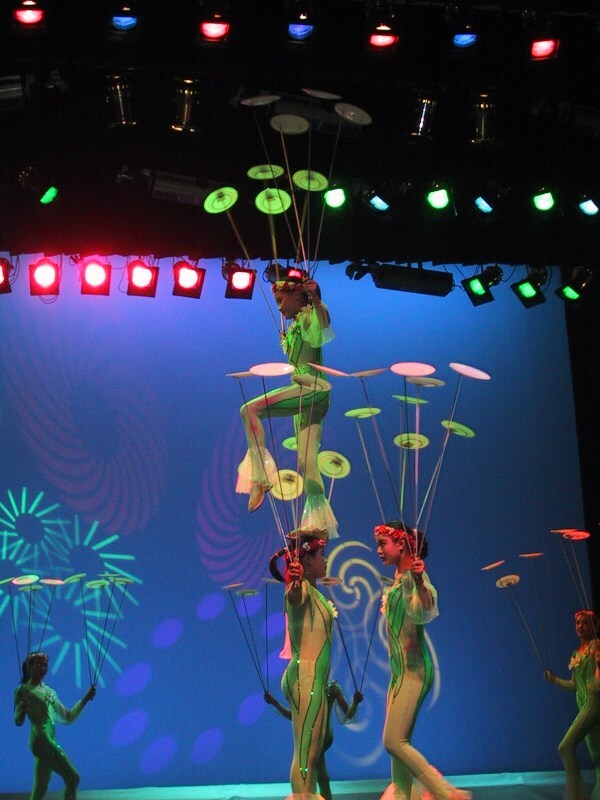 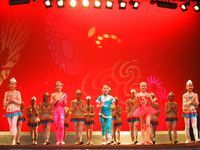 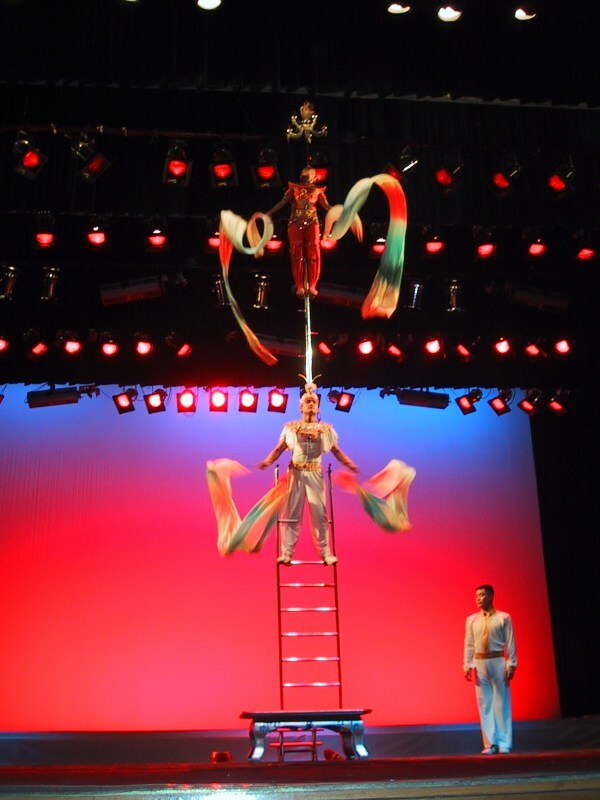 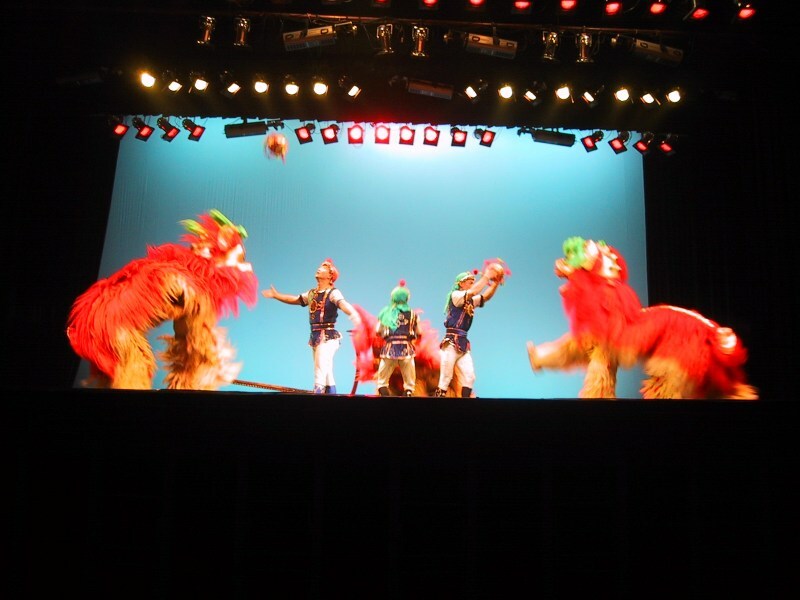 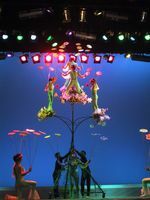 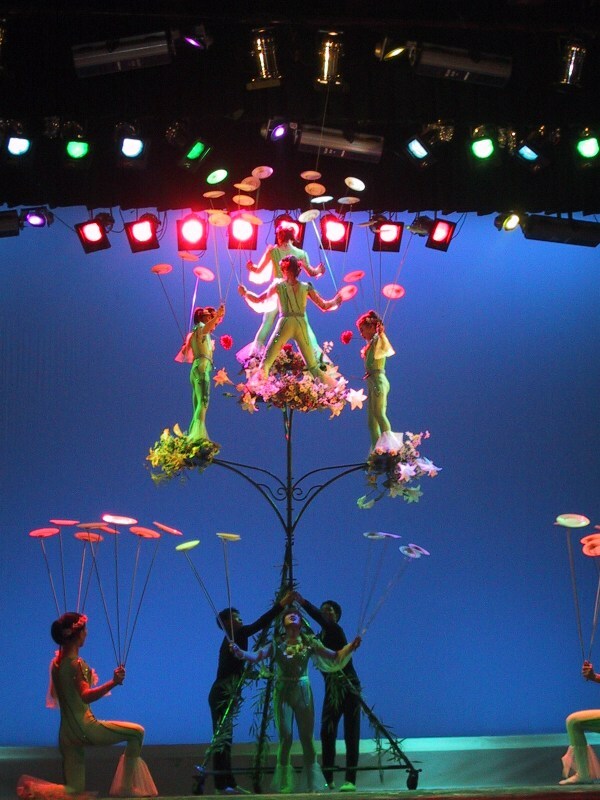 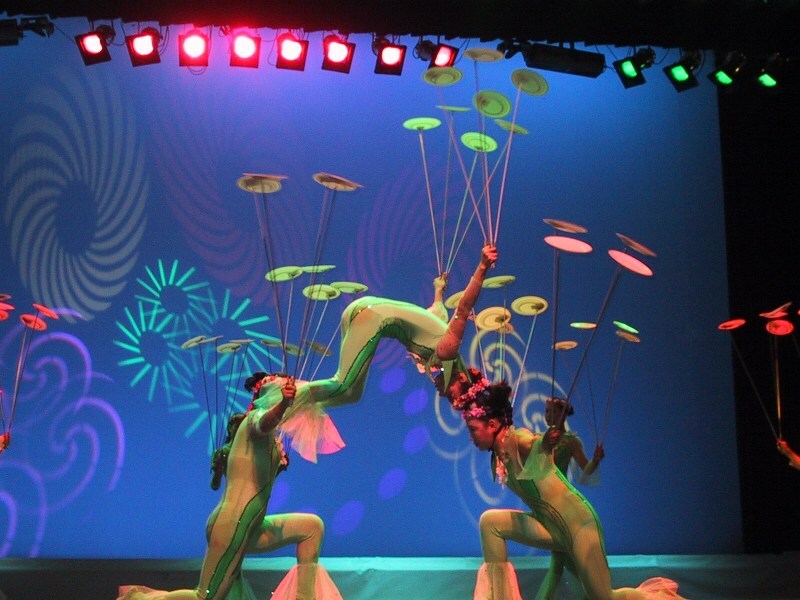 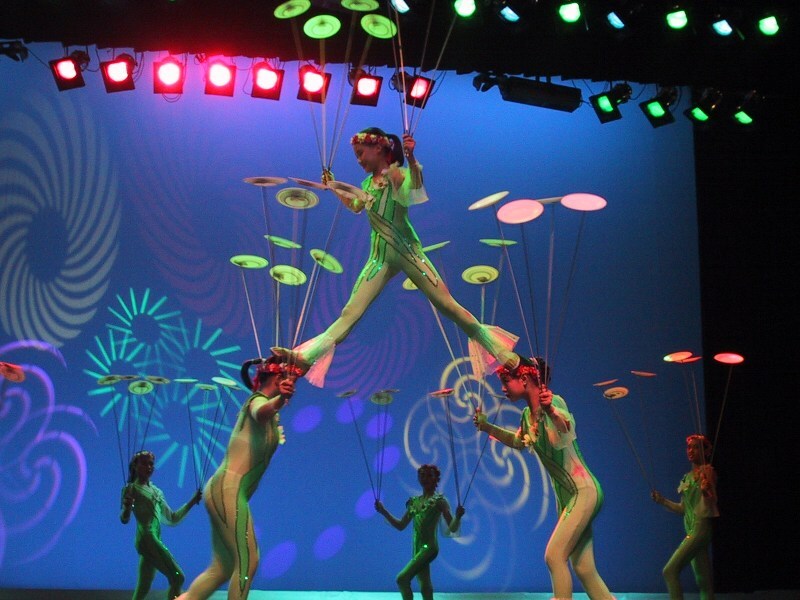 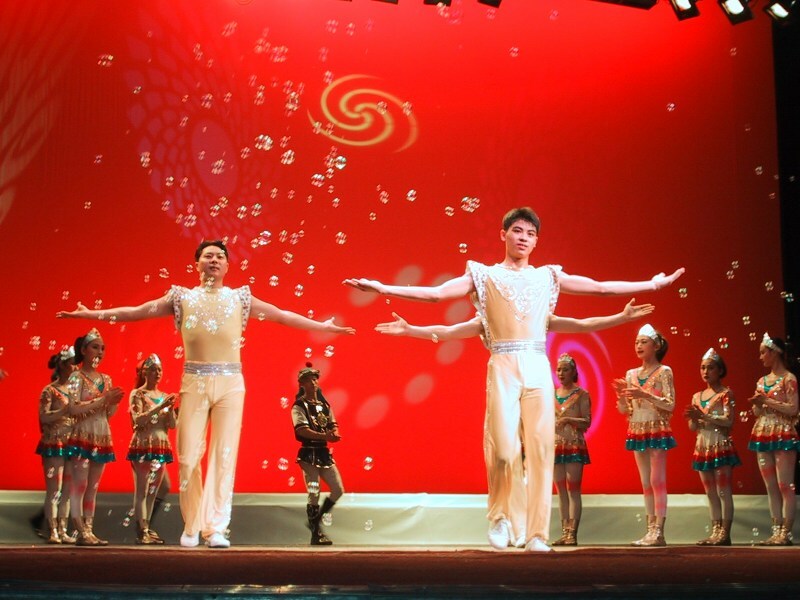 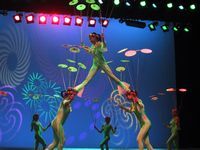 It was at the same venue that we had gone to when Michele and Alex were in Beijing, but the acrobatic troupe was different. 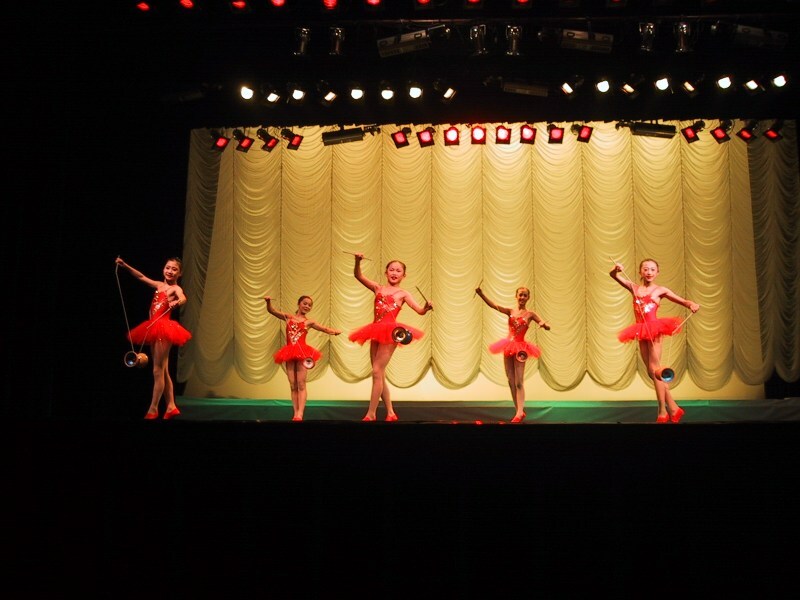 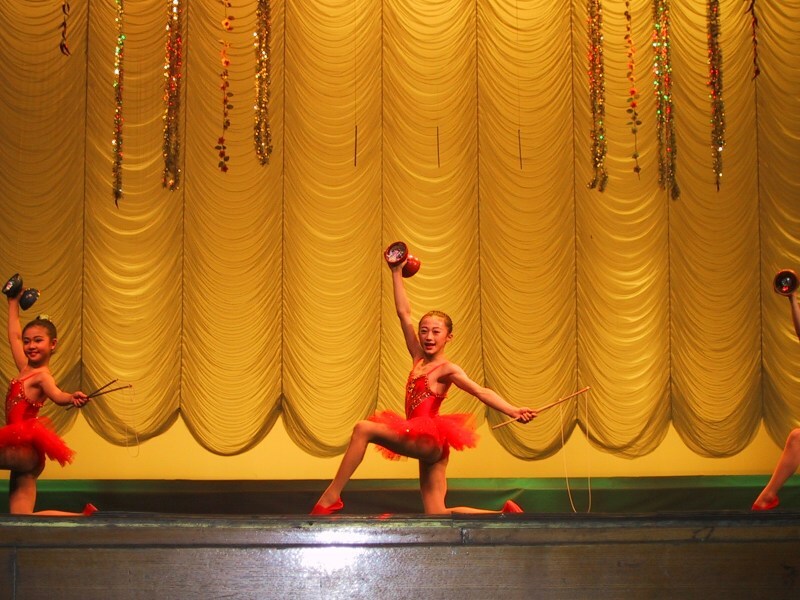 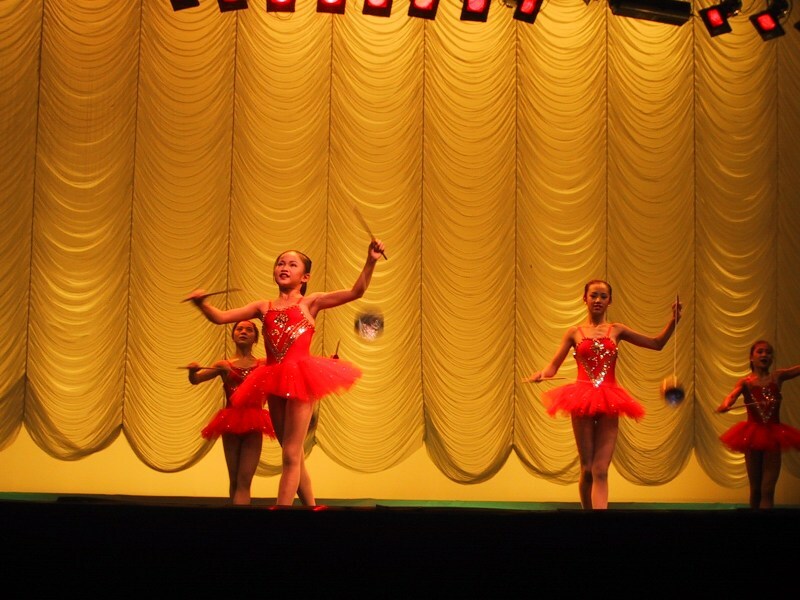 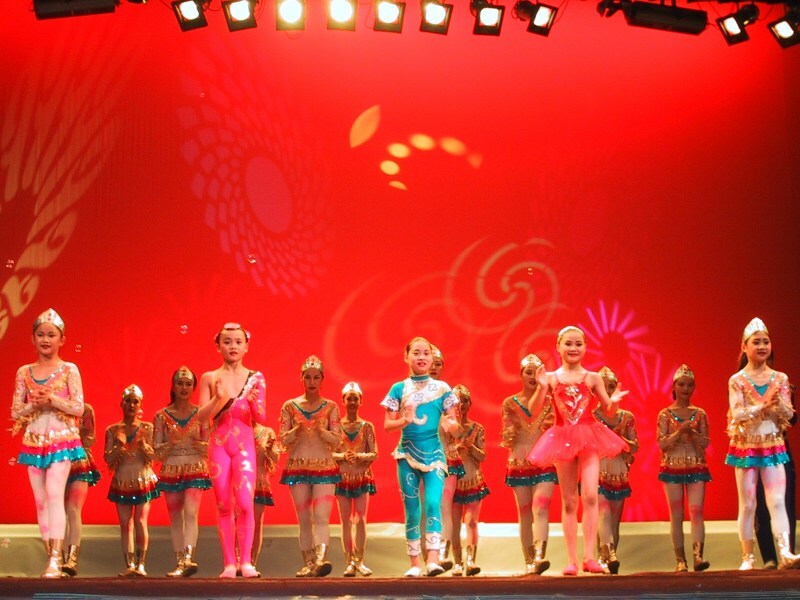 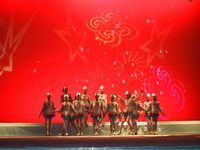 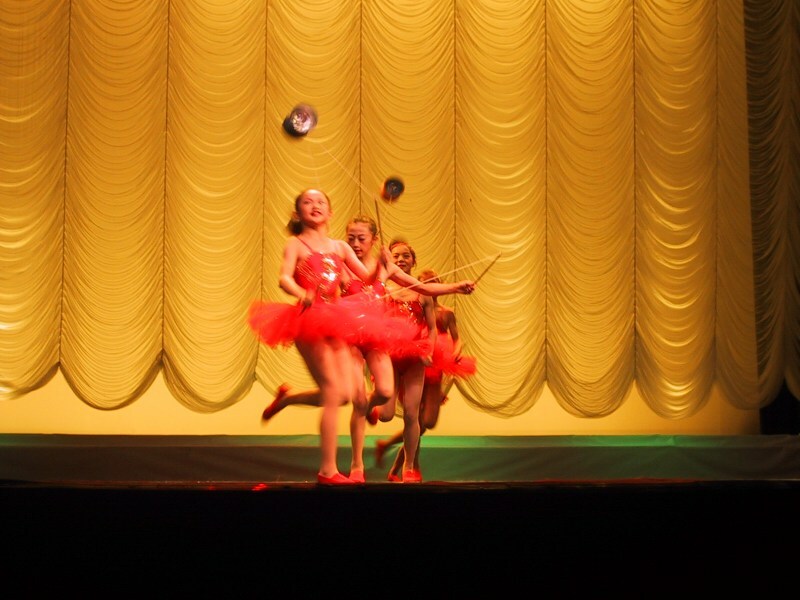 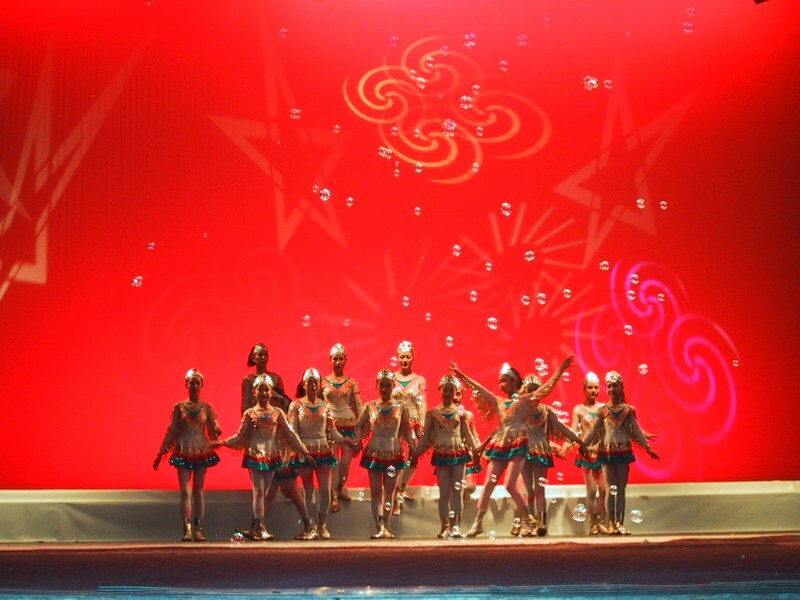 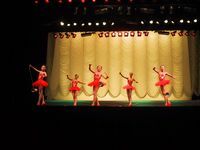 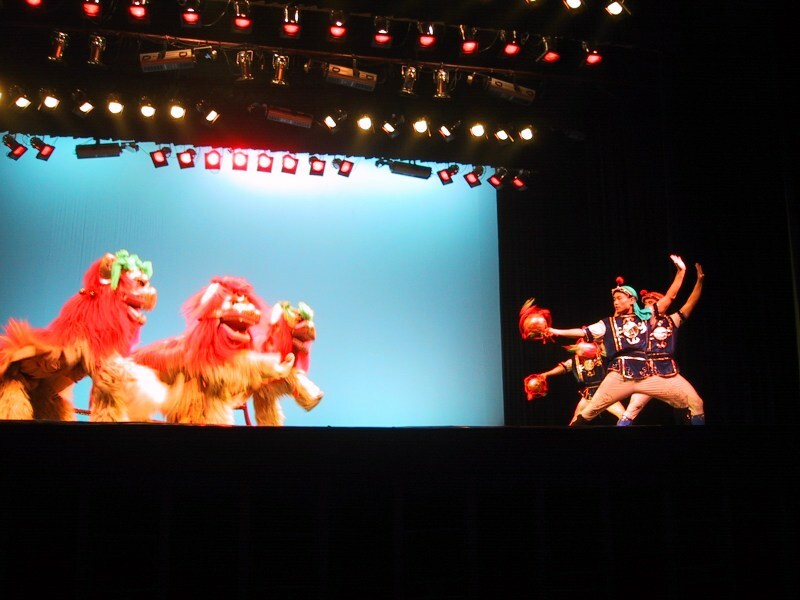 Some of the routines were the same but most were different. 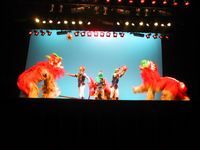 We were lucky because we bought cheaper tickets expecting to be seated towards the center of the audience but then the usher led us to the front row! We suppose that the front row seats are for some reason less desirable but we thought they were excellent! 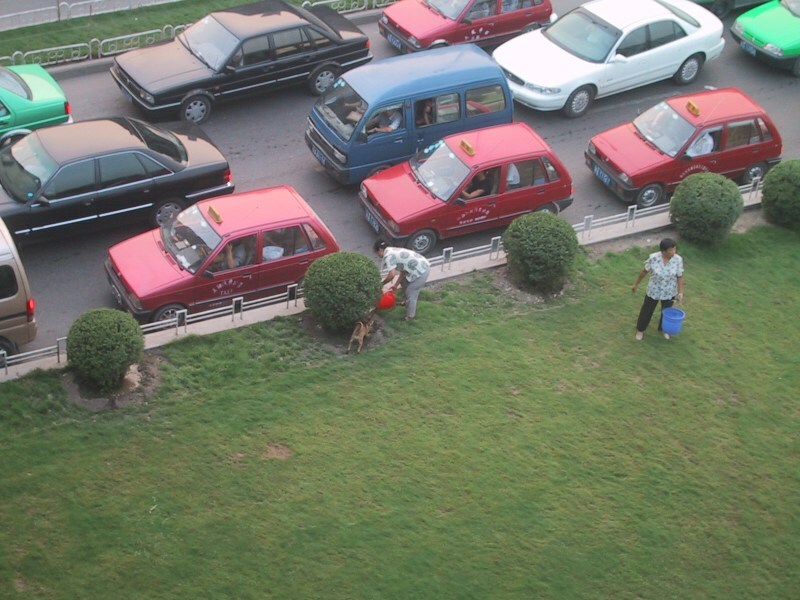 You really couldn't get any closer. 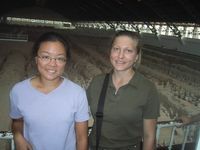 Thus ended Donna and Heather's trip to Beijing. 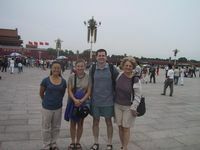 We saw them off at the airport and look forward to seeing them again when we get back to the USA!